Abstract: The rapid emergence of antibiotic resistance in pathogenic microbes is becoming an imminent global public health problem. Local application of antibiotics might be a solution. In local application, materials need to act as the drug delivery system. The drug delivery system should be biodegradable and prolonged antibacterial effect should be provided to satisfy clinical demand. Hydrogel is a promising material for local antibacterial application. Hydrogel refers to a kind of biomaterial synthesized by a water-soluble natural polymer or a synthesized polymer, which turns into gel according to the change in different signals such as temperature, ionic strength, pH, ultraviolet exposure etc. Because of its high hydrophilicity, unique three-dimensional network, fine biocompatibility and cell adhesion, hydrogel is one of the suitable biomaterials for drug delivery in antimicrobial areas. In this review, studies from the past 5 years were reviewed, and several types of antimicrobial hydrogels according to different ingredients, different preparations, different antimicrobial mechanisms, different antimicrobial agents they contained and different applications, were summarized. The hydrogels loaded with metal nanoparticles as a potential method to solve antibiotic resistance were highlighted. Finally, future prospects of development and application of antimicrobial hydrogels are suggested. Nowadays, with the rapid development of biomaterials and medical devices, health care-associated infections (HAIs) have posed severe problems on clinicians. For example, in the US, the annual costs associated with HAIs are estimated to be up to $33 billion.1 The rapid emergence of antibiotic resistance in pathogenic microbes is becoming an imminent global public health problem.2 According to a report in Lancet, most acute sequelae and global mortality were caused predominantly by infectious diseases.3 Medical devices may bring HAIs to patients in hospital. These biomaterials and medical devices including joint implants, wound dressings, catheters, cardiac pacemakers and contact lenses bring implant-associated infection, calling for an urgent need of inherent antimicrobial biomaterials and medical devices. Among all antimicrobial materials, heavy metals and natural extracts have been used for a long time since first discovered. However, these materials still have inherent disadvantages that restrict their application and efficacy. They fight against microbes as well as normal cells which cause damage to normal organs and tissues of patients.4 Antibiotics emerged in antimicrobial history 80 years ago when penicillin was discovered by Sir Alexander Fleming.2 For all these decades, antibiotics have brought us consolation until the existence of drug-resistant bacterium was discovered. At the beginning of antibiotic resistance development, conventional antibiotics such as penicillin and methicillin were noneffective to resistant strains. Now, vancomycin-resistant and linezolid-resistant strains have emerged. This has led to ceaseless demands for novel antibiotics, putting clinicians in a dilemma whether to test a novel multi-resistant strain with another antibiotic.5 Synthetic antimicrobial agents such as salicylate, chlorhexidine, isothiazolinones, thiosemicarbazones, octenidine and even quaternary ammonium compounds also faced progressive threats with the development of drug resistance.6 According to the Darwinian view of the role of antibiotics, it is widely accepted that antibiotics and antibiotic-resistant genes act as weapons and shields in shaping the structures of microbial communities.7 Nowadays, antibiotic resistance is considered as bacteria’s specific response to an injury caused by antibiotics, which means it cannot be totally avoided even if we create a new antibiotic agent.8 Increasing rates of antibiotic resistance, drug allergies and antibiotic shortages further complicate the choice of antibacterial agents.9 Problems that the traditional antimicrobial agents faced include drug resistance, overdose and cytotoxicity. These problems urgently call for an efficient and safe delivery system of drug release, which can delay the release of toxic antimicrobial agents and reduce the risk of bacterial drug resistance. Apart from antibiotics, other antimicrobial materials also have their own problems in clinical application. In recent years, antimicrobial peptides (AMPs) have been reported to have antimicrobial properties (especially short sequences) because of their ionic structure; so, it is difficult to induce resistance of bacterium or formation of biofilm.10–13 However, AMPs are also hemolytic, toxic and easy to lose efficacy and hence, AMPs need an effective drug delivery system to avoid these side effects.12,14 Besides, antimicrobial amylolytic polymers, antimicrobial polysaccharides and other antimicrobial components have also been reported, which can be frameworks of biomedical polymers.15,16 Yet, how to make these biomaterials play the greatest role in fighting against HAIs remains a problem. In these cases, a novel drug delivery system with absorbability and delayed release performance is needed. The nanocarrier system or nano-drug delivery systems (DDS) can carry the antibiotic as well as protect it. Nanomaterials with inherent antimicrobial activity or nanomaterials that can improve the efficacy and safety of antimicrobial drugs are called nanoantimicrobials (NAMs). They could be an effective alternative to conventional antibiotics by the provision of improved bioavailability, protection, mucoadhesion, absorption, controlled release and target delivery for the encapsulated or surface-adsorbed drugs.17 A set of organic, inorganic and hybrid materials can be identified in the NAM family.18 Among all the NAMs, hydrogel is a three-dimensional cross-linked polymeric network that can swell dramatically in an aqueous medium such as body fluids, while maintaining its structure and controlling drug release.19,20 Hydrogels can also be triggered by stimulations such as changes in pH, temperature, enzyme catalysis, ultraviolet gamma irradiation and even inflammation.21 Hydrogel can be coated on urinary catheters, central venous catheters,22 contact lenses, joint and dental implants23,24 and local injection for drug release and wound healing.25 Moreover, some types of hydrogels also have inherent antimicrobial properties.26,27 Combined with nanomaterials such as hydrogel, the antibacterial agent may be used at a lower dose than when administered systemically, thus overcoming the problem of resistance and diminishing other undesirable side effects to some extent.28 These characteristics have drawn remarkable attention in the pharmaceutical and medical fields especially for antimicrobial application (Figure 1). According to the development of antimicrobial agents, the progresses of antimicrobial hydrogels in recent years are shown in the following section. Figure 1 The different applications of hydrogels. Heavy metals have been used to fight against microbes for a long time. Silver, gold, copper and zinc were all reported to be used in this area. Among these metals, silver is most widely used due to its good antibacterial property and relatively low toxicity. However, other metals, such as gold, copper and zinc, have their own advantages and antibacterial spectrums. 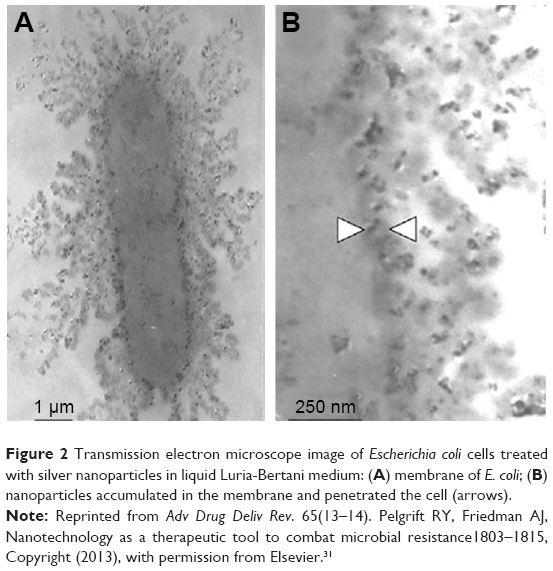 Figure 2 Transmission electron microscope image of Escherichia coli cells treated with silver nanoparticles in liquid Luria-Bertani medium: (A) membrane of E. coli; (B) nanoparticles accumulated in the membrane and penetrated the cell (arrows). In this review, we concentrate on the hydrogels that are loaded with Ag NPs. There are mainly two types of hydrogel matrices: one is the natural polymer (including modified natural polymer) and the other is the synthetic polymer. The most common natural polymers are polysaccharides. Polysaccharides mainly include alginate, chitin, chitosan (CS) and carboxymethyl cellulose (CMC). Alginate is a natural derivative linear copolymer that can form hydrogel via methods such as Ca2+ ionic interaction. Ag NPs were incorporated into alginate microbeads through electrochemical synthesis by Stojkovska et al,43,44 which showed antibacterial activity against Staphylococcus aureus and Escherichia coli. Although alginate has been already commercially in use for wound dressings, Ag NPs on alginate have high tendency to aggregate. Obradovic et al45 optimized the technique for the production of Ag/alginate microbeads by freezing–thawing based on alginate, poly(vinyl alcohol) (PVA) and poly(N-vinylpyrrolidone) (PVP) to reduce the aggregation. Ghasemzadeh et al46 also attempted to use alginate/PVA as a hydrogel matrix with sodium borohydride as a reducing agent. Madhusudana Rao et al47 went one step further by fabricating sodium alginate-based semi-interpenetrating polymer network (IPN) hydrogels for delivery of Ag NPs, and the hydrogel exhibited good antibacterial activity. The degree of cross-linking and nature of semi-IPN polymer chains are key factors in regulating the size, shape and release of nanoparticles.48 Neibert et al49 described a method to enhance mechanical strength of alginate hydrogel loaded with Ag NPs by chemical cross-linking, which is more favorable for epidermal regeneration while maintaining antibacterial properties.50 Many animal experiments on alginate hydrogel loaded with Ag NPs have been conducted, which means this kind of antimicrobial hydrogel has been studied thoroughly. Other important polysaccharides used as antimicrobial hydrogels are chitin and CS. It is notable that both chitin and CS have antimicrobial and metal-binding properties. Chitin- or CS-based hydrogels such as CS/2-glycerophosphate/nanosilver hydrogel and silver molybdate nanoparticle/chitin matrix (Ag2Mo2O7/chitin) hydrogel also provide green synthetic process and excellent antibacterial performance against E. coli.51,52 The other polysaccharide hydrogels include iota-carrageenan-based Ag NP hydrogel and Ag NP-loaded PVA/gum acacia (GA) hydrogel,53,54 both iota-carrageenan and GA are well-known polysaccharides with rich production in nature. Both the hydrogels showed good antibacterial activity against Gram-negative bacterium E. coli. Sodium CMC is another kind of biocompatible and biodegradable polysaccharide polymer which can effectively work as both reducing and stabilizing agents. It has been reported that CMC can be cross-linked by epichlorohydrin as an antimicrobial hydrogel matrix, and it can also be added into CMC and starch-composed hydrogel network as a component,55,56 both systems work well as antimicrobial hydrogels. 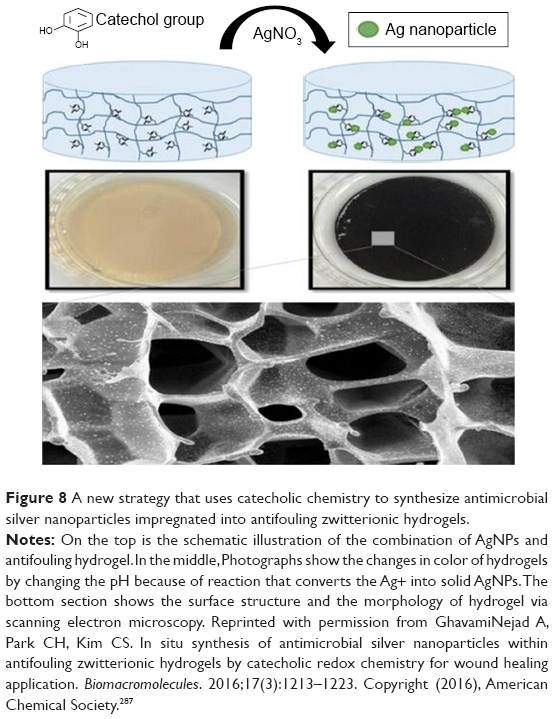 Ranga Reddy et al57 demonstrated that the natural polysaccharide gelatin has contributed an excellent property for anchoring and stabilizing the Ag NPs and formulating poly (gelatin–acrylamide) silver nanocomposite hydrogels for inactivation of bacteria. The natural hydrogels have weak antimicrobial properties, but they can be good carriers for Ag NPs, and other antibiotic agents. Moreover, they can be extracted from natural materials easily. As for a synthetic matrix for Ag NP hydrogels, there is a large diversity, but most of them are poly(acrylamide) (PAM), acrylic acid, poly(ethylene glycol) (PEG), PVA, pyrrolidone and their derivatives. The main advantage of using this template is that the morphology and size of the nanoparticles can be easily controlled by changing the amount of cross-linker and monomer of the hydrogel network.48,58,59 For example, PAM/PVA hydrogel–Ag NPs fabricated by Varaprasad et al60 can obtain Ag NPs of 2–3 nm size in gel networks, which exhibit higher antibacterial activity on E. coli compared with Ag NPs alone and Ag+-bonded hydrogels. Styrene sulfonic acid sodium salt was incorporated into hydrogels to form poly(acrylamide-styrene sulfonic acid sodium salt) Ag NP hydrogel, and the most sensitive strain it can deal with was Bacillus subtilis.58 PAM is also used to form semi-interpenetrating network hydrogels composed of pluronic and PAM by simultaneous free-radical cross-linking polymerization and served as nanoreactors for the synthesis of Ag NPs.59 PAM mixed with itaconic acid (IA) or starch to form Ag NP-loaded hydrogels was also reported to have good antibacterial properties while providing a green process of synthesis.61,62 Poly(N-isopropylacrylamide) (PNIPAM) is the second commonly used matrix in Ag NP hydrogels. James et al,63 Manjula et al64 and Zafar et al65 used PNIPAM as a main component to synthesize Ag NP hydrogels. James et al63 synthesized PNIPAM-co-allylamine nanogels and grafted them onto non-woven polypropylene. Hydrogels made by Manjula et al64 were reduced with neem leaf (Azadirachta indica) extracts, providing another green process. During the fabrication, emphasis was placed on green techniques, in order to make it environmentally friendly. Zafar et al65 mixed Ag NPs with N-isopropylacrylamide-based nanogels which had a peak of lower critical solution temperature (LCST) that is close to the human body temperature. This increases the possibility in practical medical application. All these three hydrogels demonstrated conspicuous antibacterial properties. Hydrogels of 2-acrylamido-2-methylpropane sulfonic acid sodium salt containing Ag NPs have been proved to have no cytotoxicity while exhibiting better antimicrobial ability than commercial Acticoat™ (Smith & Nephew, London, UK) and PolyMem Silver® (Ferris Mfg. Corp., Fort Worth, TX, US),66,67 which can give us more confidence in exploitation of Ag NP hydrogels. However, some researchers would like to try some new ways, such as cross-linking fumaric acid (FA) and CMC. These hydrogel-based silver nanocomposites were coated on cotton fabric for antibacterial property, and the result was promising.68 Paladini et al69 used in situ photochemical reaction to coat Ag NPs on the fibers of hydrogel and demonstrated their antibacterial capabilities by any hydrogel blend on E. coli and S. aureus. As for other Ag NP hydrogels, different matrices bring different characteristics and different processes of synthesis, all these creative points offered us a unique view on the way to more advanced antimicrobial biomaterials. Poly(acrylic acid co-poly(ethylene glycol)methyl ether acrylate)/Ag NP composite hydrogels were developed by Lee et al,70 offering a novel promising bioadhesive patch or wound dressing materials with their inherent good electrical conductivity. Thermoplastic PEG-polyhedral oligosilsesquioxane (POSS) hydrogels were synthesized from multiblock PEG-POSS polyurethanes by Wu et al,71 and their antimicrobial property lasts over 10 days. PVA/PVP-based hydrogels containing Ag NPs fabricated by Eid et al72 were reported to be high, uniformly distributed, and stable. Poly(methacrylic acid) (PMAA) hydrogel reduced with borohydride by Bajpai et al73 and poly(2-hydroxyethyl methacrylate/IA)/Ag NP hydrogels synthesized with gamma irradiation by Micic et al74 showed antimicrobial activity against E. coli. The pH-sensitive poly(methyl methacrylate-methacrylic acid)/Ag NP hydrogels synthesized with free radical cross-linking by Wei et al75 can be potentially smart antimicrobial biomaterials. All the abovementioned hydrogels displayed enhanced antimicrobial ability against E. coli, S. aureus, Pseudomonas aeruginosa and even B. subtilis. Some of them even acquired longer antimicrobial duration than antibiotics.76 The antimicrobial ability and cytotoxicity can be regulated by diverting the amount of components, which may turn out to be potentially smart antimicrobial biomaterials. The most interesting Ag NP hydrogels are hydrogels synthesized with water-soluble PEG polymers, which contain reactive catechol moieties. Synthesis of this hydrogel was inspired by mussel adhesive proteins. This biomimetic material has a strong potential for antibacterial tissue adhesives and biomaterial coatings because of the material-independent adhesive properties of catechols.78 Another new hydrogel with Ag NPs was called reduced graphene oxide (GO)-based Ag NP-containing hydrogel. This composite was fabricated in situ through the simultaneous reduction of GO and noble metal precursors within the GO gel matrix.79 This new kind of hydrogel has already been used in waste water cleansing due to its antimicrobial and antifouling properties inspiring the idea of clinical application. For example, this hydrogel can be used to deal with a polluted wound as a wound dressing. However, serum albumin also reduces the antibacterial effects of Ag NP-embedded hydrogels.80 The gene toxicity of Ag NPs has also been reported, and balances between anti-reactive oxygen species (ROS) response and DNA damage; and mitosis inhibition and chromosome instability, might play significant roles in silver-induced toxicity.81 Therefore, the vital issues are: improvement of the antimicrobial ability against Gram-positive bacteria, minimization of gene toxicity, and reduction of serum albumin when designing Ag NP-based hydrogels. More non-toxic and environmentally friendly synthetic processes such as the idea of size-controllable synthesis of Ag NPs with tobacco mosaic virus (TMV) as a biomediator without external reducing agents82 should be developed. In recent studies, more hydrogels loaded with Ag NPs have been discovered. Researchers have improved their properties, such as strong antimicrobial properties and prolonged release. All these developments and improvements ensure the clinical potential of the hydrogels. To provide clarity, all the hydrogels with Ag NPs are recorded in Table 1. Abbreviations: Ag+, silver ions; Ag NPs, silver nanoparticles; CMC, carboxymethyl cellulose; CS, chitosan; FA, fumaric acid; GA, gum acacia; HEMA, 2-hydroxyethyl methacrylate; IA, itaconic acid; IPN, interpenetrating polymer network; LCST, lower critical solution temperature; MIC, minimal inhibition concentration; MRSA, methicillin-resistant S. aureus; MW, molecular weight; NaCMC, CMC sodium salt; NIPAM, N-isopropylacrylamide; PAM, poly(acrylamide); PBS, phosphate buffered saline; PEG, poly(ethylene glycol); PMAA, Poly(methacrylic acid); PNIPAM, poly(N-isopropylacrylamide); POSS, polyhedral oligosilsesquioxane; PVA, poly(vinyl alcohol); PVP, poly(N-vinylpyrrolidone); QPVA, quaternized PVA; RGO, reduced graphene oxide; TEM, transmission electron microscope; TMV, tobacco mosaic virus; UV, ultraviolet; VRE, vancomycin-resistant Enterococcus. Gold is universally considered as biologically inert but Au NPs have a diversity of biological functions.83 Au NPs can be designed into different sizes and be functionalized with desired polymers, thus they are realized as biocompatible materials.84 Au NPs can be attached to the bacterial membrane, which leads to the leakage of bacterial contents or penetration of the outer membrane and the peptidoglycan layer, resulting in bacterial death.85 However, compared with Ag NPs, studies on antimicrobial Au NP hydrogels alone are rare. In a recent study by Brown et al,86 Au NPs lack antibacterial activity alone. However, Au NP with ampicillin bound to the surface (Au NP-AMP) killed multiple drug-resistant bacteria, including methicillin-resistant S. aureus (MRSA), P. aeruginosa, Enterobacter aerogenes and E. coli K-12 substrain DH5-alpha (pPCR-Script AMP SK+).86 Though N-isopropylacrylamide-based hydrogels containing Au NPs and pH-responsive PMAA hydrogel microcapsules carrying Au NPs had already been reported,87,88 their antimicrobial property had not been studied until Gao et al89 demonstrated that hydrogel containing Au NP-stabilized liposomes for antimicrobial application displayed excellent antibacterial properties on S. aureus without skin toxicity in a mouse model. In the research of Ribeiro et al,90 silk fibroin/nanohydroxyapatite hydrogel modified with in situ-synthesized Au NPs showed antimicrobial activity. Compared with Ag NPs, no toxicity against osteoblastic cells was found, which means Au NPs could be used for bone regeneration.90 Moreover, Jayaramudu et al91 used acrylamide (AM) and wheat protein isolate (WPI) to develop biodegradable gold nanocomposite hydrogels. The results indicated that these biodegradable gold nanocomposite hydrogels can be used as potential candidates for antibacterial applications.91 Through combination of bimetallic (Ag, Au) hydrogel nanocomposites, Ranga Reddy et al92 took it one step further to enhance their antimicrobial activity. Varaprasad et al93 even prepared dual-metallic (Ag0–Au0) nanoparticles via a green process with mint leaf extract, which exhibited significant antibacterial activity against Bacillus and E. coli (Figure 3). Although the antimicrobial ability of Au NPs is weaker than that of Ag NPs, the Au NPs have their own advantages. The antibacterial spectrum of Ag NPs is broad, including MRSA. Moreover, the hydrogels with Au NPs showed negligible interference to bone regeneration. These properties of hydrogels with Au NPs make them promising materials in clinical orthopedic surgery. 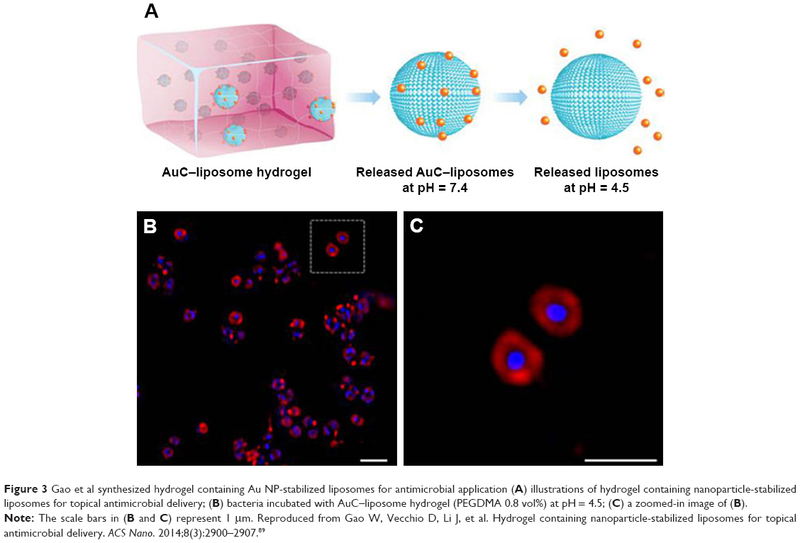 Figure 3 Gao et al synthesized hydrogel containing Au NP-stabilized liposomes for antimicrobial application (A) illustrations of hydrogel containing nanoparticle-stabilized liposomes for topical antimicrobial delivery; (B) bacteria incubated with AuC–liposome hydrogel (PEGDMA 0.8 vol%) at pH = 4.5; (C) a zoomed-in image of (B). ZnO NPs are effective against both Gram-positive and Gram-negative bacteria because of their antibacterial activity against high temperature-resistant and high pressure-resistant bacterial spores.99 Similar to Ag NPs, ZnO NPs were incorporated into PNIPAM as antimicrobial hydrogel coatings, which was demonstrated to be a promising candidate for novel biomedical device coatings.100,101 Yadollahi et al102 synthesized CMC/ZnO nanocomposite hydrogel through the in situ formation of ZnO NPs within swollen CMC hydrogels which demonstrated their antibacterial effects against E. coli and S. aureus bacteria. Nanocomposite hydrogels with IPN structure based on PEG methyl ether methacrylate-modified ZnO (ZnO-PEGMA) and 4-azidobenzoic agarose (AG-N3) exhibited an increasing anti-adhesive property and bactericidal activity toward Gram-negative E. coli and Gram-positive S. aureus.103 Moreover, the ZnO hydrogels showed great potential in drug carrying and wound healing in some recent studies.103–105 CMC and CS hydrogels were also reported to be used as a hydrogel matrix for ZnO NPs.98,99,106 CMC hydrogels exhibited antibacterial activity against both Gram-positive and Gram-negative bacteria, and CS hydrogels were confirmed eligible wound dressing materials.103,107,108 Although the antibacterial ability of ZnO NPs is relatively weak, the low cytotoxicity still indicated that ZnO NPs have potential in clinical use. Moreover, ZnO NPs have a positive effect on bone regeneration,109 which means ZnO NPs are promising materials in orthopedic surgery. There are many other metal nanoparticles combined with hydrogels, which have been studied in recent years. Their antibacterial mechanisms are shown in Figure 4.31 Apart from these commonly used metal nanoparticles, cytocompatible nickel nanoparticle-loaded chitin hydrogels were developed against S. aureus,110 and antibacterial cobalt-exchanged natural zeolite/PVA hydrogel was proved to have antibacterial activity against E. coli.111 Although copper-containing NPs (Cu NPs/CuO NPs) have weaker antibacterial effects than Ag NPs, they have a greater range of microbicidal activities against both fungi, especially Saccharomyces cerevisiae, and bacteria, including E. coli, S. aureus and Listeria monocytogenes.112–114 CMC/CuO nanocomposite hydrogels and CS hydrogel loaded with copper particles demonstrated excellent antibacterial effects against E. coli and S. aureus without causing any toxicity in recent studies.115,116 It was reported recently that magnesium-containing nanoparticles, including magnesium halogen-containing nanoparticles (MgX2 NPs) and magnesium oxide-containing nanoparticles (MgO NPs), also combat microbes through multiple mechanisms.117–119 Hezaveh and Muhamad120 loaded MgO NPs to hydrogels prepared from hydroxyalkyl κ-carrageenan derivatives, thus controlling the drug delivery in gastrointestinal tract studies. This may enlighten us with the idea that we can load hydrogels with metal nanoparticles or other ingredients to adjust the release of other drugs in the same system. Different from Ag NPs and Au NPs, other metal nanoparticles might need further exploitation as many of these kinds of metals or their alloys appear more in designing and fabricating modern medical biomaterials. The hydrogels with other metal nanoparticles are recorded in Table 2. 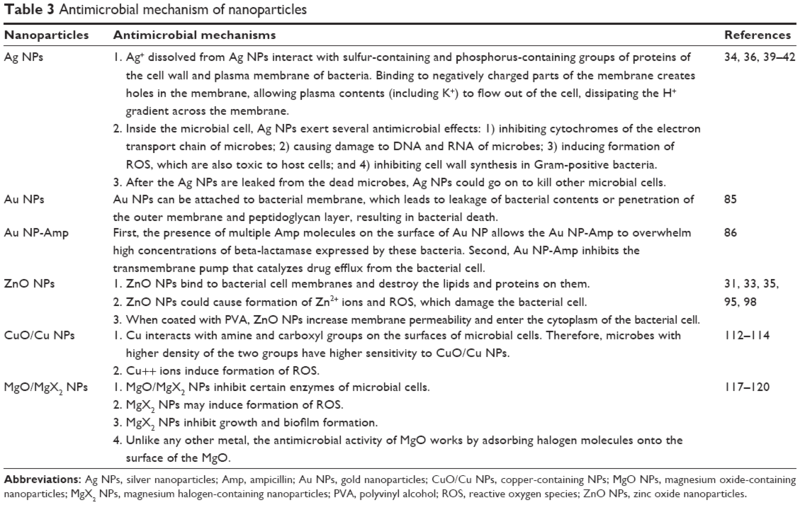 Figure 4 Multiple mechanisms of antimicrobial action of Ag NPs, ZnO NPs, copper-containing nanoparticles and Mg NPs are separately exhibited. Abbreviations: Ag NPs, silver nanoparticles; Mg NPs, magnesium-containing nanoparticles; NP, nanoparticle; ROS, reactive oxygen species; UV, ultraviolet; ZnO NPs, zinc oxide nanoparticles. Abbreviations: AG, agarose; Ag NPs, silver nanoparticles; AG-N3, 4-azidobenzoic agarose; AG-N3, 4-azidobenzoic agarose; AM, acrylamide; Au NPs, gold nanoparticles; CMC, carboxymethyl cellulose; CMCh, carboxymethyl chitosan; CS, chitosan; CuO/Cu NPs, copper-containing NPs; EDA, ethylenediamine; HA, hydroxyapatite; HT, hydrothermally treated; IPN, interpenetrating polymer network; κC, κ-carrageenan; MgO NPs, magnesium oxide-containing nanoparticles; MRSA, methicillin-resistant S. aureus; NaCMC, CMC sodium salt; PMAA, poly(methacrylic acid); SF, silk fibroin; UV, ultraviolet; ZnO NPs, zinc oxide nanoparticles; ZnO-PEGMA, poly(ethylene glycol) methyl ether methacrylate-modified ZnO. Hydrogel with metal nanoparticles might be a way to solve antibiotic resistance. There are several advantages of these antimicrobial materials. First, metal nanoparticles could be good substitutes for antibiotics. Despite widespread use of metal nanoparticles, bacterial resistance has been rarely reported. This is presumably due to the multiple mechanisms of antimicrobial action (Table 3), while antibiotics usually have only one mechanism of action. Second, the small size of particles allows them to pass through peptidoglycan cell walls and cell membranes, getting into the cytoplasm of bacterial cells easily. Third, metal nanoparticles are stable in quality, which means they could go on to kill other microbial cells after being released from dead cells. Metal nanoparticles could bring sustainable antimicrobial effect in this way. Finally, hydrogels can offer delivery system for local application. Antibacterial property improves with increasing concentration of nanoparticles. The concentration of metal nanoparticles could be high at the infection zone. All the abovementioned advantages indicate that hydrogels with nanoparticles can help to solve the present-day challenges of antimicrobial medicine. Abbreviations: Ag NPs, silver nanoparticles; Amp, ampicillin; Au NPs, gold nanoparticles; CuO/Cu NPs, copper-containing NPs; MgO NPs, magnesium oxide-containing nanoparticles; MgX2 NPs, magnesium halogen-containing nanoparticles; PVA, polyvinyl alcohol; ROS, reactive oxygen species; ZnO NPs, zinc oxide nanoparticles. Micromolecular drugs include various antibiotic agents, such as antibiotics, biological extracts and synthetic antimicrobial drugs. All these drugs have been used for their great antimicrobial properties clinically. Usually, they are systematically used in the hospital. Once carried by hydrogels, they can be used locally around the focus, and are a good way to reduce the dosage and the appearance of resistance. Though antibiotics were discovered later than metal antimicrobial agents in human history, they are undoubtedly the most commonly used, and the most effective antimicrobial agents until now.121 The drug-resistant effect of antibiotics becomes the biggest obstacle on the development and application of antibiotics. In recent years, there have been several new antibiotic approvals as well as renewed interest in second- and third-line antibiotics because of the concerns mentioned earlier.9 Almost all recent antibiotic resistance appeared in the year when the resistant bacterium were discovered (Figure 5). In recent studies, only one antibiotic, teixobactin, has no resistant bacteria strains.122 It is very effective to Gram-positive bacteria. However, the antibacterial spectrum of teixobactin does not include Gram-negative bacteria.123 Moreover, the lack of selection of resistance to teixobactin in vitro should be viewed with great caution before large scale of clinical use.124 Although the Governments of US and European Union tried to make it attractive, most pharmaceutical companies have stopped, or severely limited, investments to discover or develop new antibiotics to treat the increasing prevalence of infections caused by multidrug-resistant bacteria.125 The reason is that return on investment has been mostly negligible for antibiotics with US Food and Drug Administration (FDA) certification in the last few decades.126 There are two main ways to overcome antibiotic resistance, one is manufacture of novel antibiotics, and the other is minimizing the dosage to decrease antibiotic resistance.127 To achieve the second aim, local antibiotic administration has drawn increasing attention in recent years to improve the treatment effects. Antibiotic-loaded systems can deliver an adequate local bactericidal dose directly to the infected site, without significantly overtaking the systemic toxicity level.128 Hydrogels, as a kind of local administration matrix, offer high surface area to volume ratio and the capacity to design their physical properties such as porosity to match natural tissue. Recent studies have shown that a combination of synthetic antimicrobial polymers and antibiotics could potentially evade problems of drug resistance by taking advantages of the polymer’s membrane-lytic mechanism. Meanwhile, polymer toxicity is mitigated as the co-usage of antibiotics allows for a smaller amount of polymer in use.2 So, it is easy for hydrogels to selectively load drug molecules with controlled release at the desirable site and to offer accurate prolonged release.31,129–131 The antibiotics in common use for antimicrobial hydrogels are as follows. Abbreviations: E. coli, Escherichia coli; K. pneumoniae, Klebsiella pneumoniae; MRSA, methicillin resistant S. aureus; S. aureus, Staphylococcus aureus; VISA, vancomycin intermedicate resistant S. auereus; VRE, vancomycin-resistant Enterococcus; VRSA, vancomycin-resistant S. aureus. Ciprofloxacin is a fluoroquinolone antibacterial agent, which is active against a broad spectrum of Gram-positive and Gram-negative bacteria.136 It is the gold standard for various topical applications, such as eye and skin infections.137 Ciprofloxacin is also a recommended treatment for Shigella infections. However, ciprofloxacin-resistant Shigella sonnei are being increasingly isolated in Asia and sporadically reported on other continents.138,139 The mechanism of ciprofloxacin depends upon blockage of bacterial DNA duplication by binding itself to DNA gyrase, thereby causing double-stranded ruptures in the bacterial chromosomes, so resistance to this drug develops slowly.140 Minimal toxicity of ciprofloxacin is related to dosage, and excessive doses can cause damages to tissues, whereas hydrogels can solve this problem as a local delivery system. Ciprofloxacin can be self-assembled with a tripeptide into an antimicrobial nanostructured hydrogel to enable abundant drug to be carried along with prolonged release.129,137 Modified hydrogel coatings were reported to prevent titanium implant-associated infections.128 A hydrogel generated by polymerizing aminophenyl boronic acid in PVA with ciprofloxacin was reported to treat wound healing in diabetes patients.141 It has been reported that diseases associated with the colon such as constipation may be treated with hydrogels containing laxative psyllium and ciprofloxacin.142 Hosny136 demonstrated that a liposomal hydrogel containing ciprofloxacin improved maximum ocular availability through albino rabbit cornea. In the research of Zhou et al,143 porous scaffolds of PVA were prepared by quenching in liquid nitrogen and the freeze drying method, from different concentration aqueous solutions loaded with ciprofloxacin were fabricated. Complete inhibition of microorganism growth revealed the sustaining release of ciprofloxacin. Other researchers used dextrin and poly-based hydrogel as a carrier for ciprofloxacin, and the results suggest that hydrogel was a promising candidate for controlled release of ciprofloxacin.144,145 These studies indicate that the hydrogels loaded with ciprofloxacin have great potential of clinical administration, especially for infectious diseases due to their excellent antimicrobial properties and prolonged effect. Gentamicin is a traditional broad spectrum antibiotic used for the treatment of skin and soft tissue infections. However, systemic toxicity, especially for kidney, and low plasma concentration hinder its application.146 To avoid the side effects, gentamicin is often used locally nowadays.147,148 Local administration of functional gentamicin hydrogels offers an efficient solution. Gentamicin-loaded PVA and PVA-AAm hydrogels cross-linked by sterculia have many biomedical properties such as blood compatibility, tensile strength, burst strength, water vapor permeability and oxygen diffusion. It can be a kind of potent antimicrobial wound dressings.149,150 Superabsorbent polysaccharide gentamicin hydrogels based on pullulan derivatives also brought a broadened view about antimicrobial hydrogels. It may become one of the important applications in the future with the ability to expand to 4,000% of its volume.151 Phospholipid-modified solid lipid microparticles encapsulating gentamicin were loaded into three polymeric hydrogels. Poloxamer 407 microgels were proved to have the most desirable properties in terms of fast antibacterial activity, in vitro diffusion-dependent permeation, spread ability, pH and viscosity.152 This implied that the same drug can reach different diffusion speeds on hydrogels of different matrices. Hydrogel based on the copolymer poly(N-isopropylacrylamide-co-dimethyl-γ-butyrolactoneacrylate-co-Jeffamine® M-1000 acryl amide) (PNDJ) with delivery in >6 weeks was loaded with gentamicin. This hydrogel might decrease treatment failure for orthopedic infection.153 Inspiringly, Wu et al154 found that gentamicin sulfate (GS)-loaded carboxymethyl-chitosan (CMCh) hydrogel cross-linked by genipin was an effective and simple approach to achieve combined antibacterial efficacy and excellent osteoblastic cell responses, which has great potential in orthopedic applications. In open orthopedic surgeries, gentamicin-loaded thermosetting composite hydrogels, which were prepared combining CS with bovine bone substitutes (Orthoss® granules, Orange, CA, USA), beta-glycerophosphate as a cross-linker and lyophilized to obtain moldable composite scaffolds (moldable composite scaffold loaded with gentamicin [mCSG]), were considered to reduce the infection risks.155 The hydrogels have broken the limit of gentamicin application since the effective dosage can be decreased. Other antibiotics with serious side effects can also be used with hydrogels. Vancomycin, a macromolecular glycopeptide antibiotic, is considered as the last defense of infection clinically, especially for methicillin-resistant Staphylococcus.156,157 But now even vancomycin-resistant Enterococcus (VRE) has been found in different regions.158–160 As mentioned earlier, hydrogels as a delivery system are able to protect and enhance the validity of vancomycin. Syringeable pluronic-α-cyclodextrin (CD) supramolecular gels,161 hydrogel of thiolated CS cross-linked with maleic acid-grafted dextrin,162 thermosensitive hydrogel of CS/gelatin/β-glycerol phosphate,163 hydrogel of oligo(PEG fumarate)/sodium methacrylate (OPF/SMA) charged copolymers as biocompatible matrices,164 poly(β-amino ester) (PBAE) hydrogels mixed with PEG (MW = 400) diacrylate (PEGDA) and diethylene glycol diacrylate (DEGDA)165 and hydrogels achieved by photo cross-linking of methacrylated dextran and poly(L-glutamic acid)-g-hydroxyethyl methacrylate are all studied, and they exhibited excellent antimicrobial properties and desirable release capacity.166 The most common pathogen of osteomyelitis is S. aureus, especially MRSA. Vancomycin is always used in the treatment of osteomyelitis because it is the most effective antibiotic against MRSA. The combination of hydrogels and vancomycin is a good material, which can prevent osteomyelitis clinically. Here, synthetic antimicrobial drugs refer to the nitroimidazoles, sulfanilamide groups and other frequently used antibiotics through de novo synthesis, not including semi-synthetic antibiotics or biological extract. Synthetic drugs have many advantages because of their special chemical structures, but they bring risks and damage to normal tissue for the same reason too. So, stable and safe delivery systems become necessary.167 Nitroimidazoles can have an effect on anaerobic bacteria and amoeba, so they are often used for the digestive system.168 Ornidazole has been loaded on hydrogels composed of CMCh for colon-targeted delivery, and its release can be controlled by a change in pH.163,169 Das et al130,144,170 used dextrin and poly-based hydrogel as a carrier for ornidazole, and the result suggests that the hydrogel was a promising vehicle. Hydrogels based on dextrin grafted with poly(2-hydroxyethyl methacrylate) by embedding N,N-methylene bisacrylamide as a cross-linker can also be a good candidate for an orally administered drug delivery system for the colon region.130 Metronidazole (MTZ) containing PMAA nanogel as an oral dosage form for gastrointestinal infection171 and tinidazole containing hydrogels based on CS have also been studied.172 Moreover, floating pH-sensitive CS hydrogels containing MTZ were more effective against Helicobacter pylori than the commercially available oral MTZ tablets.173 CS/gelatin/β-glycerol phosphate hydrogels could maintain sustained release of MTZ in concentrations that are effective for eliminating pathogenic bacteria over time.163 Chlorhexidine is considered a promising antimicrobial agent and possesses a broad spectrum of activity against bacteria.174 Chlorhexidine thermosensitive hydrogel175 and chlorhexidine diacetate containing thermoresponsive hydrogel copolymers exhibit novel application of this traditional sterilization agent.176 In recent research studies, the micrometer-sized β-CD-based hydrogel (bCD-Jef-MPs) system also achieved sustained release of chlorhexidine digluconate, thus treating periodontitis lesions became effective.177 The prolonged release has made it possible to decrease its dosage. Therefore, its side effects were reduced. Octenidine, as an external application, has become active wound dressings with minimized side effects after being loaded on bacterial nanocellulose.178 Thiosemicarbazone, an antimicrobial drug used in ophthalmic diseases, was loaded on poly(2-hydroxyethyl methacrylate)-conjugated beta-CD or directly cross-linked hydroxypropyl-beta-CD to explore novel materials for fabrication of soft contact lenses.179 In the study by Sittiwong et al,180 the drug release rate of sulfanilamide-loaded PVA hydrogels could be controlled through the drug size, matrix pore size, electrode polarity and applied electric field. As for wound therapy, immobilization of cetylpyridinium chloride to PVA hydrogels offers suppressed release;181 chloramine-T and sulfadiazine sodium salt-loaded hydrogels composed of PVA, PVP and glycerin showed an excellent swelling capacity;182 a novel polyvinyl–pyrrolidone–iodine hydrogel in wound therapy was found to be able to enhance epithelialization and reduce loss of skin grafts;183 poly(N-hydroxyethyl acrylamide)/salicylate hydrogels provide both antimicrobial and antifouling functions;184 and isothiazolinones delivered in alginate hydrogel sphere achieved long-term antibacterial activity by improvement of the alkali and heat resistances.185 All these evidence showed that novel applications of synthetic drugs and hydrogels can avoid risks and side effects. The combination of synthetic drugs and hydrogels offers us a an effective clinical antimicrobial method. Besides the aforementioned most commonly used antibiotics, there are many other antibiotics loaded in hydrogels, such as amoxicillin, ampicillin, cephalosporin etc. Each of them has its own antibacterial spectrum and advantages. Amoxicillin trihydrate, a common treatment for peptic or gastric ulcers caused by H. pylori infection,186 loaded in κ-carrageenan hydrogels containing CaCO3 and NaHCO3 or CS/poly-gamma-glutamic acid nanoparticle pH-sensitive hydrogels was well protected from the gastric juice, thus facilitating drug effects specifically at the site of infection.187,188 The similar results of in vivo studies by Moogooee et al189 showed that the amoxicillin-loaded hydrogels enhance drug concentration at the topical site than powder amoxicillin, meaning that therapeutic concentration can be achieved at a much lower dose which may reduce the adverse effects of amoxicillin in high doses. Ampicillin sodium-loaded PVA–alginate physically cross-linked hydrogel exhibited both Gram-positive and Gram-negative antimicrobial properties and improved hemolysis.190 Cephalosporin belongs to beta-lactamase, and it is a widely used β-lactamase-resistant and broad spectrum antibiotic.191 Cefixime (CFX)-loaded CS/PEG hydrogel exhibited controlled release of drug and antibacterial activity against Gram-negative bacteria (E. coli) and Gram-positive bacteria (S. aureus).192 Cefditoren pivoxil hydrogels with gastroretentive effect were achieved,193 and cefazolin containing methoxy PEG-co-poly(lactic acid-co-aromatic anhydride) hydrogels offered a stable release without initial burst.194 Levofloxacin-loaded hyaluronic acid hydrogels were reported to be able to chase bacteria within the cells for both S. aureus and P. aeruginosa strains.127 In order to eradicate bacterial biofilm and avoid possible intestinal obstructions, Islan et al195 reported a smart autodegradable hydrogel containing alginate lyase (AL) and levofloxacin, which induced the reduction of drug toxicity and enhancement of drug bioavailability. A hydrogel based on (-)-menthol, which is a traditional cooling compound tailed by an amino acid derivate through an alkyl chain, can provide innoxious environment to living cells and deliver lincomycin to the local infection site.196 O-Carboxymethyl CS (O-CMCS) hydrogels synthesized from CS and monochloroacetic acid were reported as a promising carrier for antibiotics, which showed significant antibacterial activities against E. coli and S. aureus while loaded with lincomycin.197 Doxycycline was also loaded on an in situ thermally sensitive hydroxypropyl-β-CD hydrogel for ophthalmic delivery.198 Controlled release of doxycycline from CS-gelatin hydrogels cross-linked with transglutaminase was observed in other research, indicating that it is a potential carrier for cell delivery.199 Mupirocin appears to be one of the promising antimicrobials, as it is well tolerated in topical administration with very few side effects. Liposomes-in-hydrogel delivery system for mupirocin solved the problem of controlled and prolonged release of mupirocin, which offered an improved burn therapy, and substantial efforts have been devoted in the literature to prove its antibiofilm activity against S. aureus biofilms and non-toxicity against keratinocytes.200,201 The methoxypoly(ethylene glycol)-co-poly(lactic-co-glycolic acid) (mPEG-PLGA) hydrogel containing teicoplanin was reported effective for treating osteomyelitis in rabbits.202 There are a plenty of reports about different antibiotics loaded in hydrogels, but the three mentioned earlier are the mostly used ones. However, other antibiotics and hydrogel offered us with more choices when facing different bacterial infections. Meanwhile, it decreases the risk of antibiotic resistance. The controlled release of antibiotics is another advantage of hydrogels. The stable and continuous release without initial burst would ensure prolonged antimicrobial effect which can satisfy clinical demand. 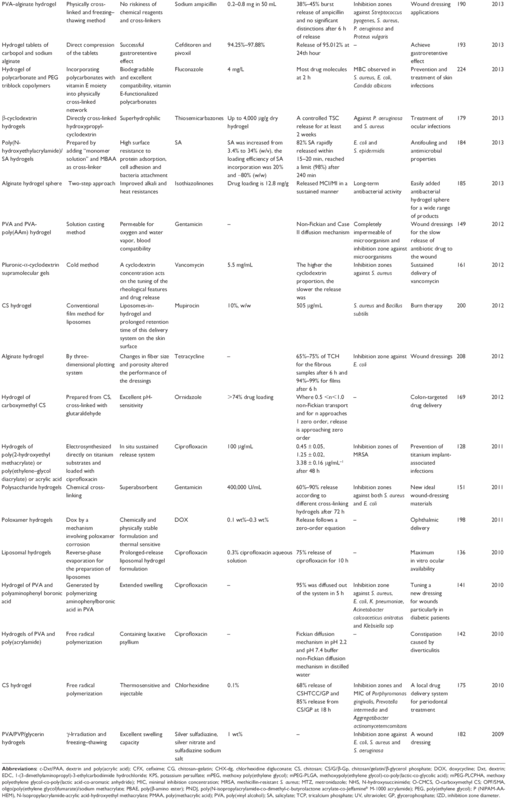 To offer an easier query, most of the hydrogels with antibiotics are recorded in this review (Table 4). Abbreviations: c-Dxt/PAA, dextrin and poly(acrylic acid); CFX, cefixime; CG, chitosan–gelatin; CHX-dg, chlorhexidine digluconate; CS, chitosan; CS/G/β-Gp, chitosan/gelatin/β-glycerol phosphate; DOX, doxycycline; Dxt, dextrin; EDC, 1-(3-dimethylaminopropyl)-3-ethylcarbodiimide hydrochloride; KPS, potassium persulfate; mPEG, methoxy poly(ethylene glycol); mPEG-PLGA, methoxypoly(ethylene glycol)-co-poly(lactic-co-glycolic acid); mPEG-PLCPHA, methoxy polyethylene glycol-co-poly(lactic acid-co-aromatic anhydride); MIC, minimal inhibition concentration; MRSA, methicillin-resistant S. aureus; MTZ, metronidazole; NHS, N-hydroxysuccinimide; O-CMCS, O-carboxymethyl CS; OPF/SMA, oligo(poly(ethylene glycol)fumarate)/sodium methacrylate; PBAE, poly(β-amino ester); PNDJ, poly(N-isopropylacrylamide-co-dimethyl-c-butyrolactone acrylate-co-Jeffamine® M-1000 acrylamide); PEG, poly(ethylene glycol); P (NIPAM-AA-HEM), N-Isopropylacrylamide-acrylic acid-hydroxyethyl methacrylate; PMAA, poly(methacrylic acid); PVA, poly(vinyl alcohol); SA, salicylate; TCP, tricalcium phosphate; UV, ultraviolet; GP, glycerophosphate; IZD, inhibition zone diameter. Biological extracts include extracts from vegetations and animals, some of these extracts have a long history of application, and others were discovered in recent years.203 For example, the therapeutic efficiency of herbal extracts and ingredients has been limited by various factors, including the lack of targeting capacity and poor bioavailability. Hydrogel is a promising carrier for the extracts of herbal medicine in recent studies.204 Following are reports of hydrogels loaded with various natural extracts. Seaweed extract-based hydrogel was reported as a novel antimicrobial wound dressing, and no seaweed-derived antimicrobials have been used in wound dressings ever before.205 Combinations of agar and carrageenan–PVA hydrogel wound dressing have been proved to be useful in treating burns, other external wounds and non-healing ulcers of diabetes.206 Hydrogels extracted and assembled from dermis samples containing basement membrane proteins vital to skin regeneration, including laminin β3, collagen IV and collagen VII, were applied as a barrier against bacteria in wound healing.207 Though according to some research studies alginate does not display antimicrobial properties, it can be an ideal wound dressing due to its morphology, fiber size, porosity, degradation and swelling ratio.205–208 Allicin–CS complexes were proved to have antibacterial activity against spoilage bacteria, and they may be used as an antimicrobial agent in foods.209 CS-based hydrogel film loaded with ethyl acetate Salix alba leaves extract showed no cytotoxicity and excellent antibacterial ability against Salmonella typhi and Candida guilliermondii.210 Achyrocline satureioides is a medicinal plant widely used in South America, which exhibits a well-documented antioxidant activity against Gram-positive and Gram-negative bacteria, as well as a set of yeast molds.211 Curcumin is non-toxic and bioactive agent with multifunction; it is found in turmeric and has been applied for centuries as a remedy to various ailments.212 However, low aqueous solubility and poor bioavailability limit the application of curcumin, and thus curcumin nanoparticles and hydrogels were developed. Ag NPs–curcumin hydrogels for wound dressing were also reported, exhibiting good antibacterial properties and sustained release, which indicate enormous prolonged therapeutic value.213,214 A polysaccharide extracted from Aloe vera, Acemannan, has various medical properties, such as antibacterial property, and it can accelerate healing of lesions.215 Some studies demonstrated its antibacterial activity against both susceptible and resistant H. pylori strains.216 Alginate hydrogels containing Aloe vera were applied in clinical wound care treatment due to their antimicrobial and anti-inflammation capacity.217 Essential oils, such as lavender, thyme oil, peppermint, tea tree, rosemary, cinnamon eucalyptus, lemongrass and others, have been found to possess particular antimicrobial properties, mainly in response to the overwhelming concern of consumers over the safety of synthetic food additives.218,219 Essential oils encapsulated in sodium alginate were reported to be qualified as disposable wound dressings.220 For those extracts from animals, honey was the most easily acquired; a Malaysian honey, Gelam honey, was incorporated into a hydrogel system to produce a functional wound dressing.221 Besides honey, bee propolis loaded into hydrogels has good antibacterial ability, making it a good wound dressing for skin wound healing.217 Another bee derivative is bee venom peptide, namely melittin, and its copolymer interactions on thermosensitive PLGA-PEG-PLGA hydrogel can be used as delivery systems for peptide drugs.222 Lysozymes, derived from normal tears with their inherent antibacterial properties, were deposited on hydrogel contact lenses that exhibit marked activity.223 Vitamin E is also an important antioxidant, biodegradable hydrogel from vitamin E-functionalized polycarbonates for antimicrobial applications; it displayed excellent compatibility with human dermal fibroblast loaded with cationic polymers and/or fluconazole at minimum biocidal concentrations.224 Lignins and lignin-derived compound model polymer, dehydrogenate polymer (DHP) in alginate hydrogel, have shown strong antimicrobial and wound healing activity.225 These biological extracts are easier to get and more readily accepted. Excellent biocompatibility and good antibacterial properties also make them promising antimicrobial biomaterials in the future. However, with the studies ongoing, we still need to test its properties once we find a new natural extract. We cannot evaluate it’s antimicrobial properties and it’s safety until we conduct some experiments about it as it is newly found. Here, hydrogels with inherent antibacterial activity refer to polymers of these hydrogels that exhibit antimicrobial activity by themselves or those whose biocidal activity is conferred through their chemical modification, not including hydrogels that incorporate antimicrobial organic compounds or active inorganic systems.6,15,226 These hydrogels developed in recent years can be regarded as novel antimicrobial agents without traditional defects.7 The main types of these hydrogels are as follows. Antimicrobial polymers are non-stimulated or potential antimicrobials. Some of the antimicrobial polymers can form hydrogels. For non-stimulated polymers, most commonly there are certain components in the chemical structures which can play a role in antimicrobial activity. These polymers could be prepared by several routes such as in situ synthesis within a hydrogel to obtain antimicrobial activities.227 Novel hydrogels composed of thermoresponsive PNIPAM and redox-responsive poly(ferrocenylsilane) (PFS) macromolecules exhibited strong antimicrobial activity while maintaining a high biocompatibility with cells.228 Jiang et al229 synthesized the quaternary ammonium salt of gelatin using 2,3-epoxypropyl trimethylammonium chloride (EPTAC) as the antimicrobial polymer ingredient of the hydrogel. pH-sensitive and temperature-sensitive hydrogels based on 2-hydroxyethyl methacrylate (HEMA) and IA copolymers were proved to have great potential for biomedical applications, especially for skin treatment and wound dressings with excellent results of microbe penetration test.230 Antimicrobial property of an antifouling hydrogel prepared by the photopolymerization of PEGDA and a monomer containing ammonium salt (RNH3Cl) in the presence of a photoinitiator was also demonstrated by a study employing E. coli.231 As for potential antimicrobial polymers, light is one of the most important factors. Photodynamic porphyrin anionic hydrogel copolymers were reported and showed great promise to the prevention of intraocular lens-associated infectious endophthalmitis.232 Another photodynamic pHEMA-based hydrogels exhibit light-induced bactericidal effect via release of NO.233 All mechanisms of these antimicrobial polymers provide not only novel antimicrobial materials but also novel delivery and release methods, which can be a turn on–off switch. Although not all the ingredients can be used as antibacterial agents, they provide us with the reference. In further research studies, we may design the antimicrobial hydrogels with some functional structures or ingredients that are able to function with bacteria. As for the other parts, we shall keep them for some other properties, such as anti-inflammation or antifouling. AMPs are an abundant and diverse group of molecules produced by multicellular organisms as a defense mechanism against competing pathogenic microbes.234 They are recognized as a possible source of panacea for the treatment of antibiotic-resistant bacterial infections,13,235 because AMPs have strong antimicrobial activity against a very broad spectrum of microorganisms, including Gram-positive and Gram-negative bacteria, fungi and virus.5,236 Although agreement about the specific mechanism of AMPs has not been reached until now, it is known that AMPs work with membranes and finally lead to bacteria killing (Figure 6).235 However, AMPs have their own disadvantages. They are not stable and easy to degrade. Moreover, antimicrobial properties of natural AMPs are not as good as antibiotics. To overcome all these disadvantages, researchers have designed some recombinant AMPs with short chains, which have improved antibacterial property. The hydrogels can also be good media for AMPs to prevent self-degradation. Figure 6 Mode of action for intracellular antimicrobial peptide activity. In this figure Escherichia coli was shown as the target microorganism from Brogden. Figure 7 Morphological observation of various microorganisms seeded on hydrogels by scanning electron microscope. Left columns (control), right columns (antimicrobial hydrogels). Abbreviations: C. albicans, Candida albicans; E. coli, Escherichia coli; F. solani, Fusarium solani; P. aeruginosa, Pseudomonas aeruginosa; S.aureus, Staphylococcus aureus; S. marcescens, Serratia marcescens. Although AMPs still have disadvantages, such as tissue toxicity and hemolysis,246,247 they also exhibited a higher antimicrobial biocompatibility index value compared with synthetic drugs with similar structures,248,249 and a lot of studies have attempted to improve the biocompatibility.234–236 A cell adhesive polypeptide and PEG hydrogel with inherent antibacterial activity was developed by Song et al as a potential scaffold for cutaneous wound healing.250 Moreover, a protein anchor developed to immobilize functional protein to PEGDA microspheres by Buhrman et al demonstrated a novel method to maintain therapeutic efficacy without toxicity.251 In the study of Xie et al,252 in situ forming biodegradable hydrogel (iFBH) system conjugated and functionalized with AMPs offered excellent bacteria inhibition and promoted wound healing without cytotoxicity. Interestingly, nanostructured hydrogels with D-amino acids for peptide self-assembling demonstrated better antimicrobial activity without cytotoxicity.253 These studies have brought us the possibility of applying the AMPs as antibiotic agents in the hospital. However, there is still a long way to go due to the fact that AMPs are not stable and they degrade easily. Whether AMPs can be kept in the hydrogels for a long time still needs further studies. Amphoteric ion hydrogels work in the similar way to AMPs. They are synthetic mimics (polymers) of AMPs; the feature of the mechanisms includes electrostatic interactions that facilitate binding of polymers with anionic bacterial membrane. The resulting amphiphilic interactions physically destroy the membrane structure, leading to cell death.254 This is also the mechanism of some types of drugs. However, we concentrate on novel amphoteric hydrogels functioning in the same way. A plethora of antimicrobial synthetic cationic polymers have been reported, including poly(acrylate) and poly(norbornene) systems, poly(arylamide)s poly-β-lactams and polycarbonates.255–262 Jiang and Cao263,264 are the frontrunners in this area and have published several works and reviews on zwitterionic polymers such as poly(carboxybetaine) (pCB) and poly(sulfobetaine) (pSB) in the construction of antimicrobial hydrogels. Mi and Jiang265 reported a new antimicrobial and non-fouling zwitterionic hydrogel through using the antibacterial salicylate anion with the negative charge to initialize its zwitterionic state. Quaternary ammonium group was one of the most famous antimicrobial materials; an in situ antimicrobial and antifouling hydrogel was fabricated from polycarbonate and PEG through Michael addition by Liu et al.266 When combined with hydrogels, amphiphiles work as effectively as AMPs. Polyampholytic hydrogels with high antibacterial activity exhibited water absorbency, making them a good carrier for water-soluble agents.267 Potent antimicrobial hydrogels were formed with anti-inflammatory N-fluorenyl-9-methoxycarbonyl (Fmoc) amino acid/peptide-functionalized cationic amphiphiles and exhibited efficient antibacterial activity against both Gram-positive and Gram-negative bacteria.268 To achieve the bifunctional aim of antibacteria and antifouling, a zwitterionic hydrogel is conjugated with an antimicrobial agent salicylate. This hydrogel can reach one-salicylate-per-monomer drug delivery while still maintaining non-fouling property at protein and bacteria levels.265 For amphiphiles, biocompatibilities may be an obstacle to overcome. Dutta et al269 developed cholesterol-based amino acid containing hydrogels with the aim to improve the biocompatibility of these amphiphilic molecules. In their studies, Ag NPs were synthesized in situ. The amphiphile-Ag NP soft nanocomposite exhibited notable antimicrobial property. Apart from disinfection of normal Gram-positive and Gram-negative bacteria, an antimycobacterial supramolecular hydrogel based on amphiphiles was developed by Bernet et al,270 which retains specific, chain length-dependent antimicrobial and antimycobacterial activity, while showing practically negligible antiproliferative cytotoxic effects. With good antibacterial properties and negligible cytotoxicity, the clinical application of amphoteric ion hydrogel still needs to be developed. These hydrogels may be a promising material to solve the problem of antibiotic resistance. Antimicrobial polysaccharides are usually natural polymer or its derivatives such as starch and CS, which are being recently used for the preparation of hydrogels because of their non-toxicity, biodegradability, biocompatibility and abundance in nature.271,272 Some of these polysaccharides have inherent antimicrobial activity, the most popular one is CS. CS has wide antibacterial spectrum of activity and high killing rate against Gram-positive and Gram-negative bacteria and low toxicity toward mammalian cells.16 As for bacteria, polysaccharide capsule plays a key role in dampening the effects of environment on bacteria. In particular, the capsule protects bacteria from osmotic stress, ensuring the cells maintain viable cytoplasmic turgor.273 CS can be dissolved in weakly acidic solution and release NH2+, which could bind with negative charge to achieve bacteria stasis.274 As for the polymers composed mainly of CS, semi-interpenetrating CMCh/poly(acrylonitrile) hydrogels were reported to have clearly better antibacterial activity with more CMCh, and hydrogel coating by electrophoretic co-deposition of CS/alkynyl CS exhibited better antibacterial activities than pure CS hydrogel.19,275 In the study by Straccia et al,276 alginate hydrogels coated with CS hydrochloride showed intrinsic antimicrobial activity against E. coli. Quaternary ammonium CS/PVA/polyethylene oxide (PEO) hydrogels were reported to exhibit a pronounced inhibitory effect against S. aureus and E. coli.277 As for the polymers containing CS which is just an antibacterial modification, PNIPAM/polyurethane copolymer hydrogel after CS modification exhibited good antibacterial activity.278 CS-grafted hydrogels containing mica nanocomposite produced a rougher surface while maintaining antibacterial activity.279 The CS hydrogels have already been used clinically as wound dressings due to their good antihemorrhagic properties. The antibacterial ability suggests that the clinical usage of CS hydrogels can be further developed in the future. Several notable peptide-based antimicrobial hydrogels have also been reported in recent years. Different from hydrogels loaded with AMPs, peptide-based hydrogels refer to those hydrogels that were synthesized with amino acid or peptides as ingredients in their structure. For example, Salick et al237 designed a β-hairpin hydrogel scaffold based on the self-assembling 20-residue peptide for tissue regeneration purposes, whereby the hydrogel itself possessed intrinsic broad-spectrum antibacterial activity. Two years after the development of the β-hairpin hydrogel, the same group reported another injectable β-hairpin hydrogel based on a different 20-residue peptide, which is capable of killing MRSA on contact.280 In the work of Schneider et al,238 the role of arginine in the structure of antibacterial peptide was highlighted which worked as instructions for the following research studies. Moreover, recently, Liu et al239 also designed a Gram-positive antibacterial peptide-containing hydrogel material which can self-assemble in response to external stimuli such as pH, ionic strength and heat. Debnath et al268 reported a class of Fmoc-protected peptide hydrogelators that contained terminal pyridinium moieties, known as possessing antibacterial properties due to their propensity for penetrating cell membranes. All of the peptide hydrogels tested were effective at killing both Gram-positive and Gram-negative bacteria.268 A related AMP hydrogel was designed by Hughes et al.281 They exploited enzymatic hydrolysis mechanisms inside E. coli cells to trigger an intracellular molecular self-assembly of amphiphilic peptide hydrogelators.281 Song et al250 developed all-synthetic polypeptide hydrogels with antibacterial activity by cross-linking poly(Lys)x(Ala)y copolymers with six-armed N-hydroxysuccinimide (NHS)-terminated PEG. Zhou et al242 modified epsilon-poly-L-lysine (EPL), an AMP produced by Streptomyces albulus, with methacrylamide moieties, and it was then cross-linked with PEGDA to form antibacterial hydrogels. Besides their antibacterial applications, these peptide-based hydrogels have offered inspiration of hydrogel design for us in the future. We can design antimicrobial hydrogels according to the different active structures of antimicrobial drugs. Therefore, the hydrogels would have excellent antimicrobial capacity. The hydrogels with inherent antibacterial activity are in Table 5. Abbreviations: Ag NPs, silver nanoparticles; Fmoc, N-fluorenyl-9-methoxycarbonyl; GST, glutathione S-transferase; PEG, poly(ethylene glycol); PEGDA, polyethylene glycol diacrylate; MIC, minimal inhibition concentration. Hydrogels with synergistic effect refer to hydrogels containing two or more antimicrobial agents combined to reach more powerful antimicrobial effect. There are two main types of antimicrobial biomaterials that are commonly reported to be incorporated into hydrogels with synergistic effect: metal nanoparticles group and antibiotics group. Those containing both metal nanoparticles and antibiotics are assigned to the antibiotics group because antibiotics feature prominently in clinical practice. Metal nanoparticles in synergistic effective hydrogels were mainly Ag NPs. Ag NPs can be loaded on synthetic amphiphilic or amino acid-based hydrogels, and they can also be loaded with biological extracts.282 Reithofer et al283 synthesized size-controlled, stable Ag NPs within ultrashort peptide hydrogels with great potential for applications in wound healing due to their low silver content, sustained Ag NP release and biocompatibility. Novel Ag NP composite systems are more suitable for biomedical applications because of their good biocompatibility with biological molecules, cells, tissues and so on.284 In situ-synthesized Ag NPs on amphiphilic hydrogels by Dutta et al285 exhibited improved biocompatibility and antimicrobial efficacy, which has promising applications in biomedicine and tissue engineering. The same laboratory also reported in situ-synthesized Ag NP in self-assemblies of amino acid-based amphiphilic hydrogel in the same year, exhibiting normal growth of mammalian cells on its surface while being lethal toward both Gram-positive and Gram-negative bacteria.286 Some researchers synthesized antimicrobial Ag NPs and impregnated them into antifouling zwitterionic hydrogels, thus getting mussel-inspired, antifouling, antibacterial hydrogels with great potential in wound healing applications (Figure 8).287 Both bactericidal hydrogels based on L-cysteine and silver nitrate and Ag(I)–glutathione hydrogel which exhibited improved cytocompatibility were reported in 2011,245,288 offering more possibilities on potential application in biomedical field such as burn wound dressings. For other combinations, Ag NP–curcumin composite hydrogels demonstrated that incorporation of curcumin into these hydrogel nanocomposites would further enhance their antibacterial efficacy. The entrapped Ag NPs and curcumin molecules proved sustained release, which could be exerted in enormous prolonged therapeutic values.213 Anjum et al289 reported a composite hydrogel for wound dressing containing nanosilver along with aloe vera and curcumin. It showed better antimicrobial nature, wound healing and infection control compared with the control group.289 Synergistic effective hydrogels containing metal nanoparticles show great antibacterial ability and large antibacterial spectrum. According to distinct antimicrobial pathways, it is impossible to develop antimicrobial resistance. These materials are promising for hospital application in the future. Figure 8 A new strategy that uses catecholic chemistry to synthesize antimicrobial silver nanoparticles impregnated into antifouling zwitterionic hydrogels. Hydrogels containing antibiotics exhibit more potent antimicrobial properties and biocompatibility when combined with other antimicrobial materials. As for traditional gentamicin, a novel controlled release zinc oxide/gentamicin–CS composite gel with potential application in wounds care was reported. ZnO, gentamicin and CS are all antimicrobial agents, but the composite gel can significantly improve minimal inhibition concentrations (MICs) of Gram-positive and Gram-negative bacteria compared with only gentamicin (Figure 9).290 Bacterial cellulose polymers functionalized by RGDC (R: arginine; G: glycine; D: aspartic acid; C: cysteine)-grafting groups and gentamicin offer a creative method for novel antimicrobial composite though it was not hydrogel.291 To cure keratitis, Paradiso et al292 added levofloxacin and chlorhexidine to vitamin E-loaded silicone hydrogel contact lenses and found that drug loaded in the lenses can be controlled to achieve a daily release in vivo. Ciprofloxacin is one of the most effective antibiotics used clinically, and it has become the gold standard for various topical applications such as skin and eye infections. It was reported to be able to be combined with different materials from metal nanoparticles to amphiphiles.137 Ciprofloxacin loaded into an antimicrobial nanostructured self-assembly tripeptide hydrogel was reported by Marchesan et al,129 which is meaningful to the design of cost-effective nanomaterials. In their design, drug incorporation in the delivery could lead to prolonged release and novel antimicrobial formulations.129 Release of ciprofloxacin loaded on PVA-based super paramagnetic nanocomposites can be magnetically mediated, which provides novel approach of release though no hydrogel formation was studied in this article.140 In in vivo studies, dextrin polymer hydrogels impregnated with amikacin and clindamycin were applied in dogs whose tibial plateau leveling osteotomy implants were removed due to suspected surgical site infection, and no signs of inflammation or infection in any dog were found at the 12th week.293 Quaternized gellan gum-based particles for controlled release of ciprofloxacin demonstrated another potential dermal application.294 Besides, tetracycline hydrochloride Ag NP composite hydrogels were developed to inhibit bacteria in simulated colon environment.295 All these synergetic effective composite hydrogels offer possible approaches for minimum of antibiotics dosage. Combination with other antibacterial ingredients can be a good way to solve the antibiotic resistance and side effects. Meanwhile, the antibacterial spectrum is enlarged, indicating that synergetic effective composite hydrogels have great potential clinically. However, synergistic effects occur when two or more drugs work together to form a stronger response than individually, known as 1+1>2 effect. In most of the abovementioned studies, researchers were more likely to describe additive effect. When the different antimicrobial ingredients were put together in hydrogel, the antibacterial spectrum was boarder and the antimicrobial effect became better compared with hydrogels loaded with one agent separately, whereas we could not tell if the overall effect was synergistic. We would like to see whether the two antimicrobial ingredients would exhibit synergistic effect or only additive effect in further study. 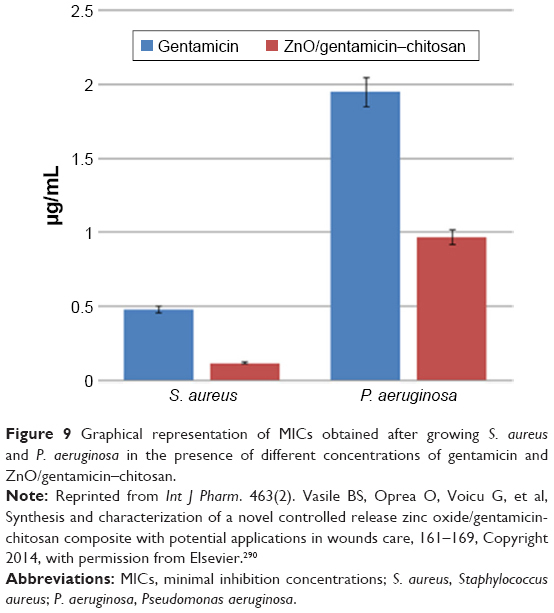 Figure 9 Graphical representation of MICs obtained after growing S. aureus and P. aeruginosa in the presence of different concentrations of gentamicin and ZnO/gentamicin–chitosan. Abbreviations: MICs, minimal inhibition concentrations; S. aureus, Staphylococcus aureus; P. aeruginosa, Pseudomonas aeruginosa. Recent advances in natural and synthetic hydrogels have either intrinsic antimicrobial properties or act as carriers for antibiotics. Hydrogels as antimicrobial biomaterials can be an alternative and amendable solution other than the traditional antibiotic treatment since too many drug-resistant bacteria were developed due to misuse of antibiotics and other antimicrobial drugs. Controlled and prolonged release, local administration, stimulated switch on–off release, enhanced mechanical strength and improved biocompatibility are important advantages which a broad diversity of hydrogels can bring. Antimicrobial hydrogels can be applied to a broad spectrum such as wound dressings, urinary tract coatings, contact lens, treatment of osteomyelitis, catheter-associated infections, gastrointestinal infections and so on, finally conquer formidable problems in traditional therapy. Novel antimicrobial biomaterials, novel combination of these materials and novel approaches will bring us brand new prospects and promising further in anti-infection treatment. For treating microbial infections, it is crucial that antimicrobial components can be released from gels to enter immune cells and kill the pathogenic microbes from inside. Hydrogels loaded with antibiotics, metal nanoparticles, antimicrobial polymers and peptides can release the antimicrobial agents in a sustained manner, which is important to treat infections effectively and prevent biofilm formation. Biodegradable antimicrobial polymer-loaded or peptide-loaded gels are more attractive than gels encapsulated with antibiotics or metal nanoparticles because antibiotics easily develop drug resistance, and it is relatively more difficult to mitigate toxicity of metal nanoparticles due to their non-degradability. Antimicrobial hydrogels could help to solve the present-day challenges of antimicrobial medicine, including antibiotic resistance. The mechanisms are as follows: 1) the antimicrobial hydrogels could be used locally, which would avoid the side effect of systemic application; 2) the hydrogels, as a novel drug delivery system providing sustainable release of antimicrobial drugs, could offer prolonged antimicrobial effect and avoid screening of resistant bacteria; 3) according to the multiple mechanisms of nanoparticles and other antibacterial ingredients, it is difficult for bacteria to develop resistance aiming at only one target; and 4) different ingredients might exhibit synergistic effect. This would bring broader antibacterial spectrum and better antimicrobial effect. Hydrogels have offered us a new way to fight against antibiotic resistance in clinical application. However, the controlled release of drugs cannot be accurate in the existing hydrogels. Some of the hydrogels degrade too fast to prolong the effect. Moreover, the antibacterial property of hydrogels is usually weak. Most of them cannot be used as antimicrobial materials alone. Some hydrogels would react with drugs they load, thus limiting their practical application. In the future, these problems still call for more research studies to be solved. As for the antimicrobial spectrum of antimicrobial hydrogels, lots of them were determined by the antimicrobial ingredients they carried. Some of the materials were only tested with specific bacteria. Some of the hydrogels were examined with both Gram-positive (usually S. aureus) and Gram-negative bacteria (E. coli). The result indicated that the antimicrobial properties of the materials was different against various bacteria. Rarely, researchers have reported the entire antimicrobial spectrum of antibacterial hydrogels in their articles. We hope that researchers could carry out more studies about the antibacterial properties of materials against different bacteria. This will help us to find out if activity against one particular bacterium is limited in scope or that nanomaterial might have broader utility. For future clinical applications, it is critical to test antimicrobial hydrogels against clinically isolated microbes, especially multidrug-resistant strains and evaluate the in vitro and in vivo biocompatibility of hydrogels and encapsulated cargo. With rational design, synthetic polymer chemistry and comprehensive in vitro and in vivo evaluation, hydrogel systems with broad-spectrum antimicrobial activity against multidrug-resistant microbes, high selectivity and negligible toxicity would find great potential in the prevention and treatment of infections. Stone PW, Pogorzelska-Maziarz M, Herzig CT, et al. State of infection prevention in US hospitals enrolled in the National Health and Safety Network. Am J Infect Control. 2014;42(2):94–99. Ng VW, Chan JM, Sardon H, et al. Antimicrobial hydrogels: a new weapon in the arsenal against multidrug-resistant infections. Adv Drug Deliv Rev. 2014;78:46–62. García-Barrasa J, López-de-Luzuriaga JM, Monge M. Silver nanoparticles: synthesis through chemical methods in solution and biomedical applications. Cent Eur J Chem. 2010;9(1):7–19. Aoki W, Kuroda K, Ueda M. Next generation of antimicrobial peptides as molecular targeted medicines. J Biosci Bioeng. 2012;114(4):365–370. Malmsten M. Antimicrobial and antiviral hydrogels. Soft Matter. 2011;7(19):8725. Martinez JL, Fajardo A, Garmendia L, et al. A global view of antibiotic resistance. FEMS Microbiol Rev. 2009;33(1):44–65. 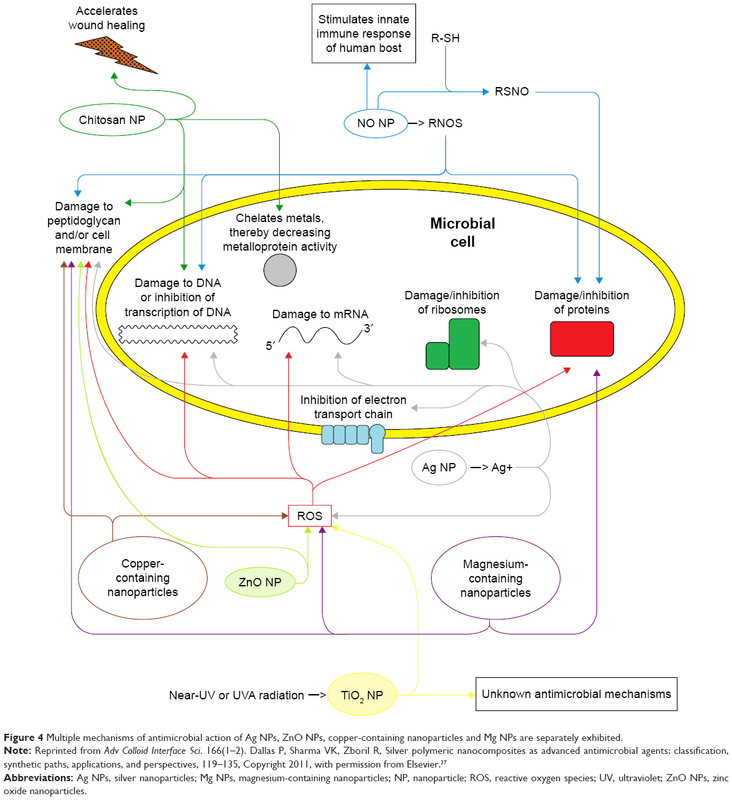 Martinez JL, Rojo F. Metabolic regulation of antibiotic resistance. FEMS Microbiol Rev. 2011;35(5):768–789. Mazer-Amirshahi M, Pourmand A, May L. Newly approved antibiotics and antibiotics reserved for resistant infections: implications for emergency medicine. Am J Emerg Med. 2017;35(1):154–158. Ramesh S, Govender T, Kruger HG, de la Torre BG, Albericio F. Short AntiMicrobial Peptides (SAMPs) as a class of extraordinary promising therapeutic agents. J Pept Sci. 2016;22(7):438–451. Scorciapino MA, Serra I, Manzo G, Rinaldi AC. Antimicrobial dendrimeric peptides: structure, activity and new therapeutic applications. Int J Mol Sci. 2017;18(3):E542. Kang HK, Kim C, Seo CH, Park Y. The therapeutic applications of antimicrobial peptides (AMPs): a patent review. J Microbiol. 2017;55(1):1–12. Dasgupta A, Mondal JH, Das D. Peptide hydrogels. RSC Adv. 2013;3(24):9117. Mitra RN, Shome A, Paul P, Das PK. Antimicrobial activity, biocompatibility and hydrogelation ability of dipeptide-based amphiphiles. Org Biomol Chem. 2009;7(1):94–102. Muñoz-Bonilla A, Fernández-García M. Polymeric materials with antimicrobial activity. Prog Polym Sci. 2012;37(2):281–339. Kong M, Chen XG, Xing K, Park HJ. Antimicrobial properties of chitosan and mode of action: a state of the art review. Int J Food Microbiol. 2010;144(1):51–63. Jamil B, Imran M. Factors pivotal for designing of nanoantimicrobials: an exposition. Crit Rev Microbiol. 2018;44(1):79–94. Cavalieri F, Tortora M, Stringaro A, Colone M, Baldassarri L. Nanomedicines for antimicrobial interventions. J Hosp Infect. 2014;88(4):183–190. Mohamed RR, Seoudi RS, Sabaa MW. Synthesis and characterization of antibacterial semi-interpenetrating carboxymethyl chitosan/poly (acrylonitrile) hydrogels. Cellulose. 2012;19(3):947–958. Hamidi M, Azadi A, Rafiei P. Hydrogel nanoparticles in drug delivery. Adv Drug Deliv Rev. 2008;60(15):1638–1649. 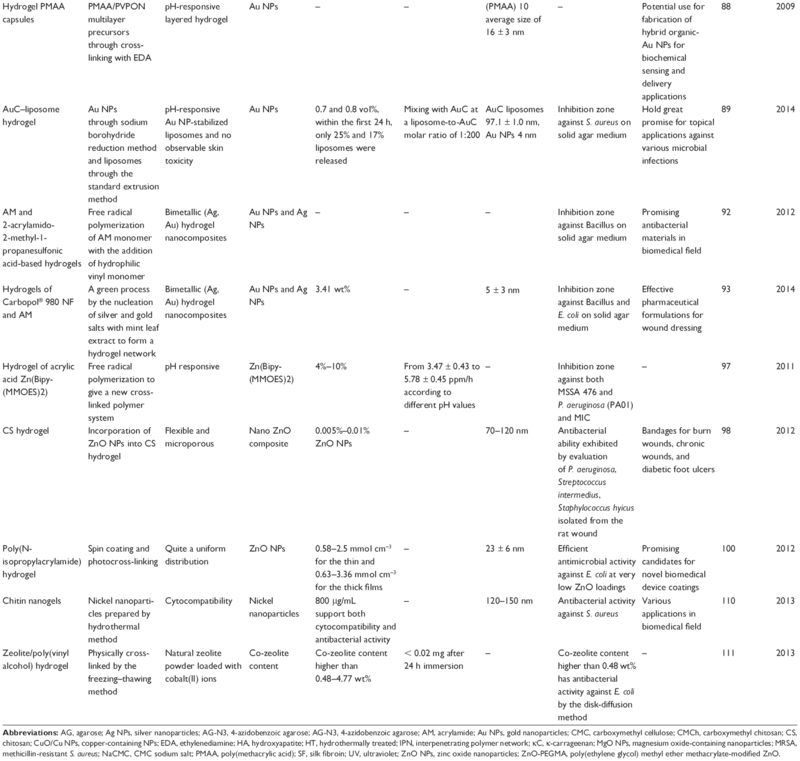 Zhang S, Ermann J, Succi MD, et al. An inflammation-targeting hydrogel for local drug delivery in inflammatory bowel disease. Sci Transl Med. 2015;7(300):300ra128. Noimark S, Dunnill CW, Wilson M, Parkin IP. The role of surfaces in catheter-associated infections. Chem Soc Rev. 2009;38(12):3435–3448. Hetrick EM, Schoenfisch MH. Reducing implant-related infections: active release strategies. Chem Soc Rev. 2006;35(9):780–789. Shea LD, Woodruff TK, Shikanov A. Bioengineering the ovarian follicle microenvironment. Annu Rev Biomed Eng. 2014;16:29–52. Ghobril C, Grinstaff MW. The chemistry and engineering of polymeric hydrogel adhesives for wound closure: a tutorial. Chem Soc Rev. 2015;44(7):1820–1835. Sahiner N, Sagbas S, Sahiner M, Silan C, Aktas N, Turk M. Biocompatible and biodegradable poly(Tannic Acid) hydrogel with antimicrobial and antioxidant properties. Int J Biol Macromol. 2016;82:150–159. Tsao CT, Chang CH, Lin YY, et al. Antibacterial activity and biocompatibility of a chitosan-gamma-poly(glutamic acid) polyelectrolyte complex hydrogel. Carbohydr Res. 2010;345(12):1774–1780. Hemeg HA. Nanomaterials for alternative antibacterial therapy. Int J Nanomedicine. 2017;12:8211–8225. Sahiner N. Soft and flexible hydrogel templates of different sizes and various functionalities for metal nanoparticle preparation and their use in catalysis. Prog Polym Sci. 2013;38(9):1329–1356. Hu R, Li G, Jiang Y, et al. Silver–zwitterion organic–inorganic nanocomposite with antimicrobial and antiadhesive capabilities. Langmuir. 2013;29(11):3773–3779. Pelgrift RY, Friedman AJ. Nanotechnology as a therapeutic tool to combat microbial resistance. Adv Drug Deliv Rev. 2013;65(13–14):1803–1815. Skladanowski M, Golinska P. Evaluation of cytotoxicity, immune compatibility and antibacterial activity of biogenic silver nanoparticles. Med Microbiol Immunol. 2016;205(6):603–613. Blecher K, Nasir A, Friedman A. The growing role of nanotechnology in combating infectious disease. Virulence. 2011;2(5):395–401. Lara HH, Ayala-Núñez NV, Padilla CR. Bactericidal effect of silver nanoparticles against multidrug-resistant bacteria. World J Microbiol Biotechnol. 2010;26(4):615–621. Huh AJ, Kwon YJ. “Nanoantibiotics”: a new paradigm for treating infectious diseases using nanomaterials in the antibiotics resistant era. J Control Release. 2011;156(2):128–145. Hindi KM, Ditto AJ, Panzner MJ, et al. The antimicrobial efficacy of sustained release silver-carbene complex-loaded L-tyrosine polyphosphate nanoparticles: characterization, in vitro and in vivo studies. Biomaterials. 2009;30(22):3771–3779. Dallas P, Sharma VK, Zboril R. Silver polymeric nanocomposites as advanced antimicrobial agents: classification, synthetic paths, applications, and perspectives. Adv Colloid Interface Sci. 2011;166(1–2):119–135. Patil MP, Kim GD. Eco-friendly approach for nanoparticles synthesis and mechanism behind antibacterial activity of silver and anticancer activity of gold nanoparticles. Appl Microbiol Biotechnol. 2017;101(1):79–92. Ivask A, Elbadawy A, Kaweeteerawat C, et al. Toxicity mechanisms in Escherichia coli vary for silver nanoparticles and differ from ionic silver. ACS Nano. 2014;8(1):374–386. Taglietti A, Diaz Fernandez YA, Amato E, et al. Antibacterial activity of glutathione-coated silver nanoparticles against Gram Positive and Gram Negative bacteria. Langmuir. 2012;28(21):8140–8148. Guo L, Yuan W, Lu Z, Li CM. Polymer/nanosilver composite coatings for antibacterial applications. Colloids Surf A Phys Eng Aspects. 2013;439:69–83. Knetsch MLW, Koole LH. New strategies in the development of antimicrobial coatings: the example of increasing usage of silver and silver nanoparticles. Polymers. 2011;3(1):340–366. Jovanović Ž, Stojkovska J, Obradović B, Mišković-Stanković V. Alginate hydrogel microbeads incorporated with Ag nanoparticles obtained by electrochemical method. Mater Chem Phys. 2012;133(1):182–189. Stojkovska J, Kostić D, Jovanović Ž, Vukašinović-Sekulić M, Mišković-Stanković V, Obradović B. A comprehensive approach to in vitro functional evaluation of Ag/alginate nanocomposite hydrogels. Carbohydr Polym. 2014;111:305–314. Obradovic B, Stojkovska J, Jovanovic Z, Miskovic-Stankovic V. Novel alginate based nanocomposite hydrogels with incorporated silver nanoparticles. J Mater Sci Mat Med. 2012;23(1):99–107. Ghasemzadeh H, Ghanaat F. Antimicrobial alginate/PVA silver nanocomposite hydrogel, synthesis and characterization. J Polym Res. 2014;21(3):355. Madhusudana Rao K, Krishna Rao KSV, Ramanjaneyulu G, Chowdoji Rao K, Subha MCS, Ha C-S. Biodegradable sodium alginate-based semi-interpenetrating polymer network hydrogels for antibacterial application. J Biomed Mater Res A. 2013;102(9):3196–3206. Murali Mohan Y, Vimala K, Thomas V, et al. Controlling of silver nanoparticles structure by hydrogel networks. J Colloid Interface Sci. 2010;342(1):73–82. Neibert K, Gopishetty V, Grigoryev A, et al. Wound-healing with mechanically robust and biodegradable hydrogel fibers loaded with silver nanoparticles. Adv Healthc Mater. 2012;1(5):621–630. Murthy PS, Murali Mohan Y, Varaprasad K, Sreedhar B, Mohana Raju K. First successful design of semi-IPN hydrogel-silver nanocomposites: a facile approach for antibacterial application. J Colloid Interface Sci. 2008;318(2):217–224. Chang HW, Lin YS, Tsai YD, Tsai ML. Effects of chitosan characteristics on the physicochemical properties, antibacterial activity, and cytotoxicity of chitosan/2-glycerophosphate/nanosilver hydrogels. J Appl Polym Sci. 2013;127(1):169–176. Tang H, Lu A, Li L, Zhou W, Xie Z, Zhang L. Highly antibacterial materials constructed from silver molybdate nanoparticles immobilized in chitin matrix. Chem Eng J. 2013;234:124–131. Jayaramudu T, Raghavendra GM, Varaprasad K, Sadiku R, Ramam K, Raju KM. Iota-Carrageenan-based biodegradable Ag0 nanocomposite hydrogels for the inactivation of bacteria. Carbohydr Polym. 2013;95(1):188–194. Juby KA, Dwivedi C, Kumar M, Kota S, Misra HS, Bajaj PN. Silver nanoparticle-loaded PVA/gum acacia hydrogel: synthesis, characterization and antibacterial study. Carbohydr Polym. 2012;89(3):906–913. Hebeish A, Hashem M, El-Hady MM, Sharaf S. Development of CMC hydrogels loaded with silver nano-particles for medical applications. Carbohydr Polym. 2013;92(1):407–413. Vimala K, Samba Sivudu K, Murali Mohan Y, Sreedhar B, Mohana Raju K. Controlled silver nanoparticles synthesis in semi-hydrogel networks of poly(acrylamide) and carbohydrates: a rational methodology for antibacterial application. Carbohydr Polym. 2009;75(3):463–471. Reddy PR, Varaprasad K, Sadiku R, et al. Development of gelatin based inorganic nanocomposite hydrogels for inactivation of bacteria. J Inorg Organometal Polym Mater. 2013;23(5):1054–1060. El-Sherif H, El-Masry M, Kansoh A. Hydrogels as template nanoreactors for silver nanoparticles formation and their antimicrobial activities. Macromol Res. 2011;19(11):1157–1165. Park S, Murthy PSK, Park S, Mohan YM, Koh W-G. Preparation of silver nanoparticle-containing semi-interpenetrating network hydrogels composed of pluronic and poly(acrylamide) with antibacterial property. J Ind Eng Chem. 2011;17(2):293–297. Varaprasad K, Mohan YM, Ravindra S, et al. Hydrogel-silver nanoparticle composites: a new generation of antimicrobials. J Appl Polym Sci. 2010;115(2):1199–1207. Eid M, Araby E. Bactericidal effect of poly(acrylamide/itaconic acid)-silver nanoparticles synthesized by gamma irradiation against Pseudomonas aeruginosa. Appl Biochem Biotechnol. 2013;171(2):469–487. Abdel-Halim ES, Al-Deyab SS. Antimicrobial activity of silver/starch/polyacrylamide nanocomposite. Int J Biol Macromol. 2014;68:33–38. James C, Johnson AL, Jenkins AT. Antimicrobial surface grafted thermally responsive PNIPAM-co-ALA nano-gels. Chem Commun. 2011;47(48):12777–12779. Manjula B, Varaprasad K, Sadiku R, Ramam K, Reddy GVS, Raju KM. Development of microbial resistant thermosensitive Ag nanocomposite (gelatin) hydrogels via green process. J Biomed Mater Res A. 2014;102(4):928–934. Zafar M, Shah T, Rawal A, Siores E. Preparation and characterisation of thermoresponsive nanogels for smart antibacterial fabrics. Mater Sci Eng C. 2014;40:135–141. Boonkaew B, Kempf M, Kimble R, Supaphol P, Cuttle L. Antimicrobial efficacy of a novel silver hydrogel dressing compared to two common silver burn wound dressings: acticoat and PolyMem Silver((R)). Burns. 2014;40(1):89–96. Boonkaew B, Suwanpreuksa P, Cuttle L, Barber PM, Supaphol P. Hydrogels containing silver nanoparticles for burn wounds show antimicrobial activity without cytotoxicity. J Appl Polyme Sci. 2014;131:40215. Bozaci E, Akar E, Ozdogan E, Demir A, Altinisik A, Seki Y. Application of carboxymethylcellulose hydrogel based silver nanocomposites on cotton fabrics for antibacterial property. Carbohydr Polym. 2015;134:128–135. Raho R, Paladini F, Lombardi FA, Boccarella S, Zunino B, Pollini M. In-situ photo-assisted deposition of silver particles on hydrogel fibers for antibacterial applications. Mater Sci Eng C Mater Biol Appl. 2015;55:42–49. Lee W-F, Tsao K-T. Effect of silver nanoparticles content on the various properties of nanocomposite hydrogels by in situ polymerization. J Sci Mater. 2009;45(1):89–97. Wu J, Hou S, Ren D, Mather PT. Antimicrobial properties of nanostructured hydrogel webs containing silver. Biomacromolecules. 2009;10(9):2686–2693. Eid M, El-Arnaouty MB, Salah M, Soliman E-S, Hegazy E-SA. Radiation synthesis and characterization of poly(vinyl alcohol)/poly(N-vinyl-2-pyrrolidone) based hydrogels containing silver nanoparticles. J Polym Res. 2012;19(3):. Bajpai S, Chand N, Mahendra M. In situ formation of silver nanoparticles in poly (methacrylic acid) hydrogel for antibacterial applications. Polym Eng Sci. 2013;53(8):1751–1759. Micic M, Milic TV, Mitric M, Jokic B, Suljovrujic E. Radiation synthesis, characterisation and antimicrobial application of novel copolymeric silver/poly (2-hydroxyethyl methacrylate/itaconic acid) nanocomposite hydrogels. Polym Bull. 2013;70(12):3347–3357. Wei Q-B, Fu F, Zhang Y-Q, Tang L. Preparation, characterization, and antibacterial properties of pH-responsive P(MMA-co-MAA)/silver nanocomposite hydrogels. J Polym Res. 2014;21(2):349. Bhowmick S, Mohanty S, Koul V. Fabrication of transparent quaternized PVA/silver nanocomposite hydrogel and its evaluation as an antimicrobial patch for wound care systems. J Mater Sci Mater Med. 2016;27(11):160. Malcher M, Volodkin D, Heurtault B, et al. Embedded silver ions-containing liposomes in polyelectrolyte multilayers: cargos films for antibacterial agents. Langmuir. 2008;24(18):10209–10215. Jiao T, Guo H, Zhang Q, et al. Reduced graphene oxide-based silver nanoparticle-containing composite hydrogel as highly efficient dye catalysts for wastewater treatment. Sci Rep. 2015;5:11873. Grade S, Eberhard J, Neumeister A, et al. Serum albumin reduces the antibacterial and cytotoxic effects of hydrogel-embedded colloidal silver nanoparticles. RSC Adv. 2012;2(18):7190. Xu L, Li X, Takemura T, Hanagata N, Wu G, Chou LL. Genotoxicity and molecular response of silver nanoparticle (NP)-based hydrogel. J Nanobiotechnol. 2012;10(16):1–11. Yang C, Jung S, Yi H. A biofabrication approach for controlled synthesis of silver nanoparticles with high catalytic and antibacterial activities. Biochem Eng J. 2014;89(8):10–20. Faoucher E, Nativo P, Black K, et al. In situ preparation of network forming gold nanoparticles in agarose hydrogels. Chem Commun. 2009;(43):6661. Daniel-da-Silva AL, Salgueiro AM, Trindade T. Effects of Au nanoparticles on thermoresponsive genipin-crosslinked gelatin hydrogels. Gold Bull. 2013;46(1):25–33. Zhao Y, Jiang X. Multiple strategies to activate gold nanoparticles as antibiotics. Nanoscale. 2013;5(18):8340–8350. Brown AN, Smith K, Samuels TA, Lu J, Obare SO, Scott ME. Nanoparticles functionalized with ampicillin destroy multiple-antibiotic-resistant isolates of Pseudomonas aeruginosa and Enterobacter aerogenes and methicillin-resistant Staphylococcus aureus. Appl Environ Microbiol. 2012;78(8):2768. Guiney LM, Agnello AD, Thomas JC, Takatori K, Flynn NT. Thermoresponsive behavior of charged N-isopropylacrylamide-based hydrogels containing gold nanostructures. Colloid Polym Sci. 2009;287(5):601–608. Kozlovskaya V, Kharlampieva E, Chang S, Muhlbauer R, Tsukruk VV. pH-responsive layered hydrogel microcapsules as gold nanoreactors. Chem Mater. 2009;21(10):2158–2167. Gao W, Vecchio D, Li J, et al. Hydrogel containing nanoparticle-stabilized liposomes for topical antimicrobial delivery. ACS Nano. 2014;8(3):2900–2907. Ribeiro M, Ferraz MP, Monteiro FJ, et al. Antibacterial silk fibroin/nanohydroxyapatite hydrogels with silver and gold nanoparticles for bone regeneration. Nanomedicine. 2017;13(1):231–239. Jayaramudu T, Raghavendra GM, Varaprasad K, Sadiku R, Raju KM. Development of novel biodegradable Au nanocomposite hydrogels based on wheat: for inactivation of bacteria. Carbohydr Polym. 2013;92(2):2193–2200. Ranga Reddy P, Varaprasad K, Narayana Reddy N, Mohana Raju K, Reddy NS. Fabrication of Au and Ag Bi-metallic nanocomposite for antimicrobial applications. J Appl Polym Scince. 2012;125(2):1357–1362. Varaprasad K, Siva Mohan Reddy G, Jayaramudu J, Sadiku R, Ramam K, Ray SS. Development of microbial resistant Carbopol nanocomposite hydrogels via a green process. Biomater Sci. 2014;2(2):257. Weir E, Lawlor A, Whelan A, Regan F. The use of nanoparticles in anti-microbial materials and their characterization. Analyst. 2008;133(7):835–845. Hajipour MJ, Fromm KM, Ashkarran AA, et al. Antibacterial properties of nanoparticles. Trends Biotechnol. 2012;30(10):499–511. Wu S, Du Y, Hu Y, Shi X, Zhang L. Antioxidant and antimicrobial activity of xylan-chitooligomer-zinc complex. Food Chem. 2013;138(2–3):1312–1319. James C, Pugh T, Johnson AL, Jenkins ATA. An antimicrobial zinc based molecule for cross linking poly-acrylic acid. Eur Polym J. 2011;47(6):1338–1345. Sudheesh Kumar PT, Lakshmanan V-K, Anilkumar TV, et al. Flexible and microporous chitosan hydrogel/nano ZnO composite bandages for wound dressing: in vitro and in vivo evaluation. ACS Appl Mater Interfaces. 2012;4(5):2618–2629. Hashem M, Sharaf S, Abd El-Hady MM, Hebeish A. Synthesis and characterization of novel carboxymethylcellulose hydrogels and carboxymethylcellulolse-hydrogel-ZnO-nanocomposites. Carbohydr Polym. 2013;95(1):421–427. Schwartz VB, Thétiot F, Ritz S, et al. Antibacterial surface coatings from zinc oxide nanoparticles embedded in poly(N-isopropylacrylamide) hydrogel surface layers. Adv Funct Mater. 2012;22(11):2376–2386. Mohandas A, Kumar PTS, Raja B, Lakshmanan VK, Jayakumar R. Exploration of alginate hydrogel/nano zinc oxide composite bandages for infected wounds. Int J Nanomed. 2015;10(suppl 1):53–66. Yadollahi M, Gholamali I, Namazi H, Aghazadeh M. Synthesis and characterization of antibacterial carboxymethyl cellulose/ZnO nanocomposite hydrogels. Int J Biol Macromol. 2015;74:136–141. Wang J, Hu H, Yang Z, Wei J, Li J. IPN hydrogel nanocomposites based on agarose and ZnO with antifouling and bactericidal properties. Mater Sci Eng C Mater Biol Appl. 2016;61:376–386. Zare-Akbari Z, Farhadnejad H, Furughi-Nia B, Abedin S, Yadollahi M, Khorsand-Ghayeni M. PH-sensitive bionanocomposite hydrogel beads based on carboxymethyl cellulose/ZnO nanoparticle as drug carrier. Int J Biol Macromol. 2016;93(pt A):1317–1327. Yadollahi M, Farhoudian S, Barkhordari S, Gholamali I, Farhadnejad H, Motasadizadeh H. Facile synthesis of chitosan/ZnO bio-nanocomposite hydrogel beads as drug delivery systems. Int J Biol Macromol. 2016;82:273–278. Wahid F, Yin JJ, Xue DD, et al. Synthesis and characterization of antibacterial carboxymethyl Chitosan/ZnO nanocomposite hydrogels. Int J Biol Macromol. 2016;88:273–279. Huang L, Dai T, Xuan Y, Tegos GP, Hamblin MR. Synergistic combination of chitosan acetate with nanoparticle silver as a topical antimicrobial: efficacy against bacterial burn infections. Antimicrobial Agents Chemother. 2011;55(7):3432. Friedman AJ, Phan J, Schairer DO, et al. Antimicrobial and anti-inflammatory activity of chitosan-alginate nanoparticles: a targeted therapy for cutaneous pathogens. J Invest Dermatol. 2013;133(5):1231. Fielding G, Bose S. SiO2 and ZnO dopants in three-dimensionally printed tricalcium phosphate bone tissue engineering scaffolds enhance osteogenesis and angiogenesis in vivo. Acta Biomater. 2013;9(11):9137–9148. Kumar NA, Rejinold NS, Anjali P, Balakrishnan A, Biswas R, Jayakumar R. Preparation of chitin nanogels containing nickel nanoparticles. Carbohydr Polym. 2013;97(2):469–474. Narin G, Albayrak ÇB, Ülkü S. Preparation and characterization of antibacterial cobalt-exchanged natural zeolite/poly(vinyl alcohol) hydrogels. J Sol-Gel Sci Technol. 2013;69(1):214–230. Kruk T, Szczepanowicz K, Stefanska J, Socha RP, Warszynski P. Synthesis and antimicrobial activity of monodisperse copper nanoparticles. Colloids Surf B Biointerfaces. 2015;128:17–22. Ingle AP, Duran N, Rai M. Bioactivity, mechanism of action, and cytotoxicity of copper-based nanoparticles: a review. Appl Microbiol Biotechnol. 2014;98(3):1001–1009. Zhong T, Oporto GS, Jaczynski J, Jiang C. Nanofibrillated cellulose and copper nanoparticles embedded in polyvinyl alcohol films for antimicrobial applications. Biomed Res Int. 2015;2015:456834. Yadollahi M, Gholamali I, Namazi H, Aghazadeh M. Synthesis and characterization of antibacterial carboxymethylcellulose/CuO bio-nanocomposite hydrogels. Int J Biol Macromol. 2015;73:109–114. Rajasekaran P, Santra S. Hydrothermally treated chitosan hydrogel loaded with copper and zinc particles as a potential micronutrient-based antimicrobial feed additive. Front Vet Sci. 2015;2:62. Ramanujam K, Sundrarajan M. Antibacterial effects of biosynthesized MgO nanoparticles using ethanolic fruit extract of Emblica officinalis. J Photochem Photobiol B Biol. 2014;141:296–300. Leung YH, Ng AM, Xu X, et al. Mechanisms of antibacterial activity of MgO: non-ROS mediated toxicity of MgO nanoparticles towards Escherichia coli. Small. 2014;10(6):1171–1183. He Y, Ingudam S, Reed S, Gehring A, Strobaugh TP Jr, Irwin P. Study on the mechanism of antibacterial action of magnesium oxide nanoparticles against foodborne pathogens. J Nanobiotechnol. 2016;14(1):54. Hezaveh H, Muhamad II. Impact of metal oxide nanoparticles on oral release properties of pH-sensitive hydrogel nanocomposites. Int J Biol Macromol. 2012;50(5):1334–1340. Norowski PA Jr, Bumgardner JD. Biomaterial and antibiotic strategies for peri-implantitis: a review. J Biomed Mater Res B Appl Biomater. 2009;88(2):530–543. Giltrap AM, Dowman LJ, Nagalingam G, et al. Total synthesis of teixobactin. Org Lett. 2016;18(11):2788. Marshall H. New antibiotic discovered for Gram-positive bacteria. Lancet Respir Med. 2015;3(2):104–104. Arias CA, Murray BE. 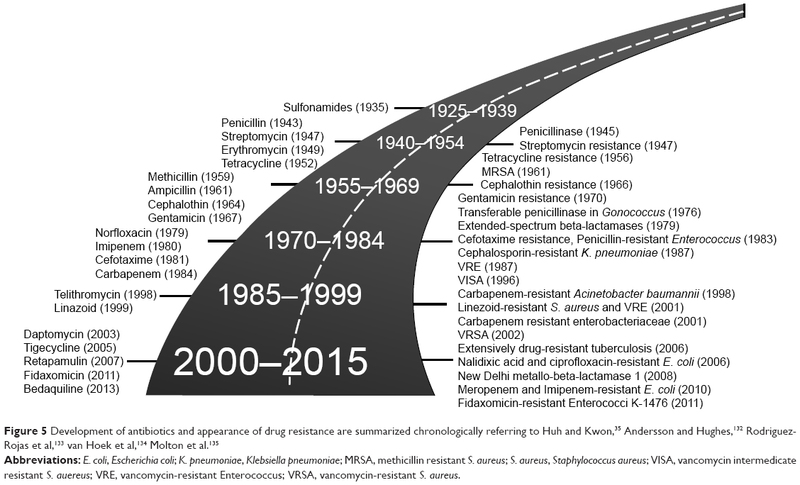 A new antibiotic and the evolution of resistance. N Engl J Med. 2015;372(12):1168–1170. Kelly S. The drug push. Science. 2015;348(6237):850–853. 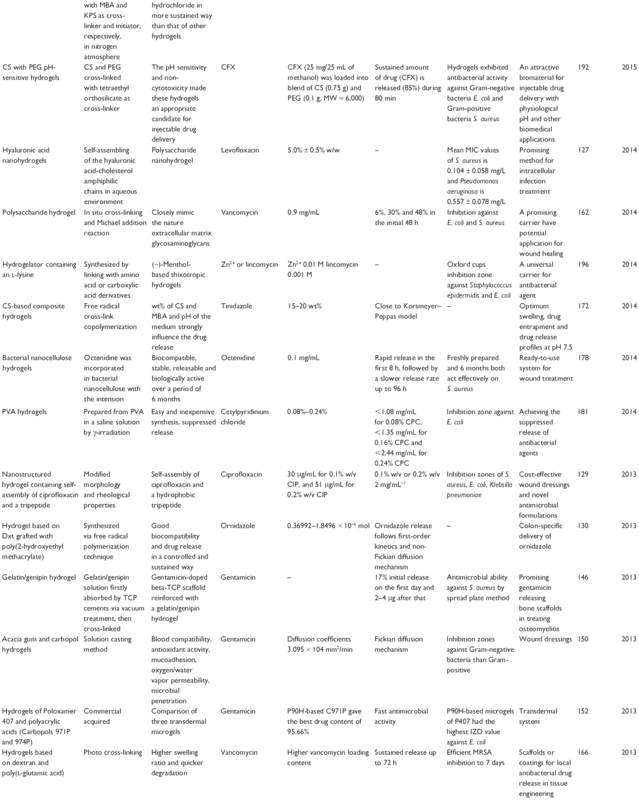 Fernandes P, Martens E. Antibiotics in late clinical development. Biochem Pharmacol. 2017;133:152–163. Montanari E, D’Arrigo G, Di Meo C, et al. Chasing bacteria within the cells using levofloxacin-loaded hyaluronic acid nanohydrogels. Eur J Pharm Biopharm. 2014;87(3):518–523. De Giglio E, Cometa S, Ricci MA, et al. Ciprofloxacin-modified electrosynthesized hydrogel coatings to prevent titanium-implant-associated infections. Acta Biomater. 2011;7(2):882–891. Marchesan S, Qu Y, Waddington LJ, et al. Self-assembly of ciprofloxacin and a tripeptide into an antimicrobial nanostructured hydrogel. Biomaterials. 2013;34(14):3678–3687. Das D, Das R, Ghosh P, Dhara S, Panda AB, Pal S. Dextrin cross linked with poly (HEMA): a novel hydrogel for colon specific delivery of ornidazole. RSC Adv. 2013;3(47):25340–25350. Singh B, Varshney L, Francis S, Rajneesh. Designing tragacanth gum based sterile hydrogel by radiation method for use in drug delivery and wound dressing applications. Int J Biol Macromol. 2016;88:586–602. Andersson DI, Hughes D. Persistence of antibiotic resistance in bacterial populations. FEMS Microbiol Rev. 2011;35(5):901–911. Rodriguez-Rojas A, Rodriguez-Beltran J, Couce A, Blazquez J. Antibiotics and antibiotic resistance: a bitter fight against evolution. Int J Med Microbiol. 2013;303(6–7):293–297. van Hoek AH, Mevius D, Guerra B, Mullany P, Roberts AP, Aarts HJ. 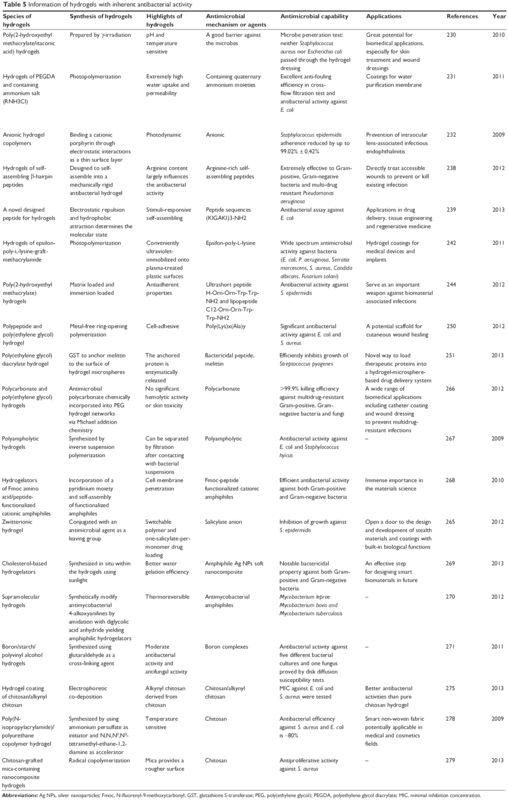 Acquired antibiotic resistance genes: an overview. Front Microbiol. 2011;2:203. Molton JS, Tambyah PA, Ang BS, Ling ML, Fisher DA. The global spread of healthcare-associated multidrug-resistant bacteria: a perspective from Asia. Clin Infect Dis. 2013;56(9):1310–1318. Hosny KM. Ciprofloxacin as ocular liposomal hydrogel. AAPS PharmSciTech. 2010;11(1):241–246. Lequeux I, Ducasse E, Jouenne T, Thebault P. Addition of antimicrobial properties to hyaluronic acid by grafting of antimicrobial peptide. Eur Polym J. 2014;51:182–190. Bowen A, Hurd J, Hoover C, et al. 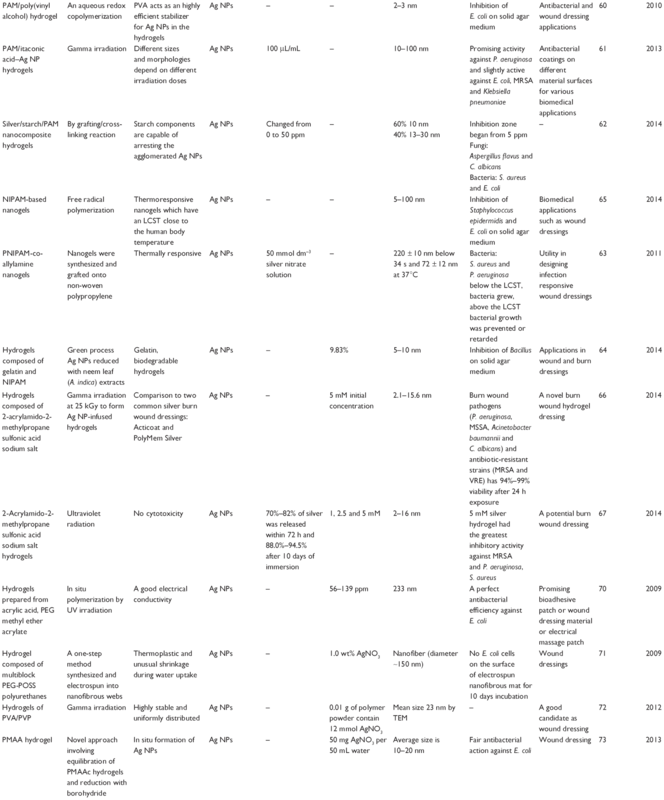 Importation and domestic transmission of Shigella sonnei resistant to ciprofloxacin – United States, May 2014-February 2015. MMWR Morb Mortal Wkly Rep. 2015;64(12):318–320. Chung The H, Rabaa MA. South Asia as a reservoir for the global spread of ciprofloxacin-resistant Shigella sonnei: a cross-sectional study. PLoS Med. 2016;13(8):e1002055. Bajpai AK, Gupta R. Magnetically mediated release of ciprofloxacin from polyvinyl alcohol based superparamagnetic nanocomposites. J Mater Sci Mater Med. 2011;22(2):357–369. Manju S, Antony M, Sreenivasan K. Synthesis and evaluation of a hydrogel that binds glucose and releases ciprofloxacin. J Sci Mater. 2010;45(15):4006–4012. Singh B, Sharma N, Sharma V. Slow release of ciprofloxacin from double potential drug delivery system. J Sci Mater. 2010;46(8):2587–2599. Zhou XH, Wei DX, Ye HM, Zhang X, Meng X, Zhou Q. Development of poly(vinyl alcohol) porous scaffold with high strength and well ciprofloxacin release efficiency. Mater Sci Eng C Mater Biol Appl. 2016;67:326–335. Das D, Ghosh P, Dhara S, Panda AB, Pal S. Dextrin and poly(acrylic acid)-based biodegradable, non-cytotoxic, chemically cross-linked hydrogel for sustained release of ornidazole and ciprofloxacin. ACS Appl Mater Interfaces. 2015;7(8):4791–4803. Das D, Pal S. Dextrin/poly (HEMA): pH responsive porous hydrogel for controlled release of ciprofloxacin. Int J Biol Macromol. 2015;72:171–178. Wu T, Zhang Q, Ren W, et al. Controlled release of gentamicin from gelatin/genipin reinforced beta-tricalcium phosphate scaffold for the treatment of osteomyelitis. J Mater Chem B. 2013;1(26):3304. Lv YF, Wang J, Dong F, Yang DH. Meta-analysis of local gentamicin for prophylaxis of surgical site infections in colorectal surgery. Int J Colorectal Dis. 2016;31(2):393–402. Musters GD, Burger JW, Buskens CJ, Bemelman WA, Tanis PJ. 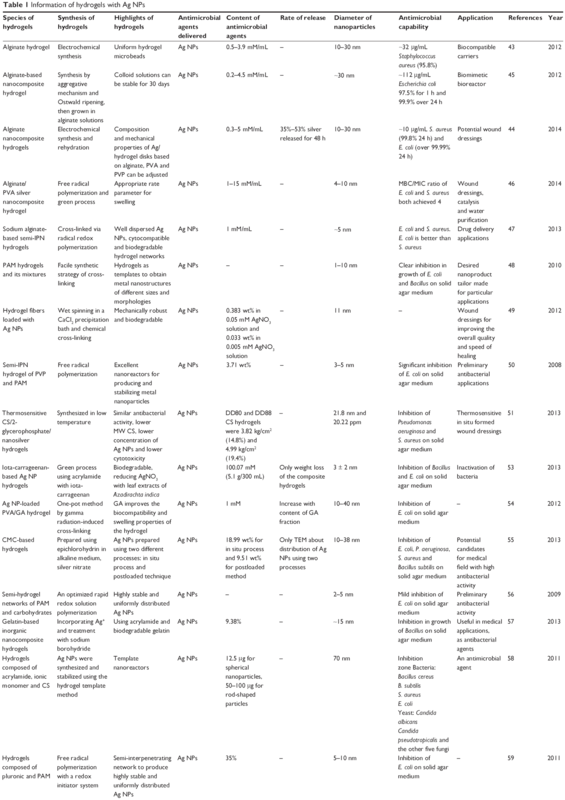 Local application of gentamicin in the prophylaxis of perineal wound infection after abdominoperineal resection: a systematic review. World J Surg. 2015;39(11):2786–2794. Singh B, Pal L. Sterculia crosslinked PVA and PVA-poly(AAm) hydrogel wound dressings for slow drug delivery: mechanical, mucoadhesive, biocompatible and permeability properties. J Mech Behav Biomed Mater. 2012;9:9–21. Singh B, Sharma S, Dhiman A. Design of antibiotic containing hydrogel wound dressings: biomedical properties and histological study of wound healing. Int J Pharm. 2013;457(1):82–91. Li H, Yang J, Hu X, Liang J, Fan Y, Zhang X. Superabsorbent polysaccharide hydrogels based on pullulan derivate as antibacterial release wound dressing. J Biomed Mater Res A. 2011;98(1):31–39. Nnamani PO, Kenechukwu FC, Dibua EU, Ogbonna CC, Monemeh UL, Attama AA. Transdermal microgels of gentamicin. Eur J Pharm Biopharm. 2013;84(2):345–354. Overstreet D, McLaren A, Calara F, Vernon B, McLemore R. Local gentamicin delivery from resorbable viscous hydrogels is therapeutically effective. Clin Orthop Relat Res. 2015;473(1):337–347. Wu F, Meng G, He J, Wu Y, Wu F, Gu Z. Antibiotic-loaded chitosan hydrogel with superior dual functions: antibacterial efficacy and osteoblastic cell responses. ACS Appl Mater Interfaces. 2014;6(13):10005–10013. Dorati R, De Trizio A, Genta I, Merelli A, Modena T, Conti B. Gentamicin-loaded thermosetting hydrogel and moldable composite scaffold: formulation study and biologic evaluation. J Pharm Sci. 2017;106(6):1596–1607. Lovati AB, Drago L, Bottagisio M, et al. Systemic and local administration of antimicrobial and cell therapies to prevent methicillin-resistant Staphylococcus epidermidis-induced femoral nonunions in a rat model. Mediators Inflamm. 2016;2016:9595706. Ng K, Mabasa VH, Chow I, Ensom MH. Systematic review of efficacy, pharmacokinetics, and administration of intraventricular vancomycin in adults. Neurocrit Care. 2014;20(1):158–171. Walsh TR, Weeks J, Livermore DM, Toleman MA. Dissemination of NDM-1 positive bacteria in the New Delhi environment and its implications for human health: an environmental point prevalence study. Lancet Infect Dis. 2011;11(5):355–362. 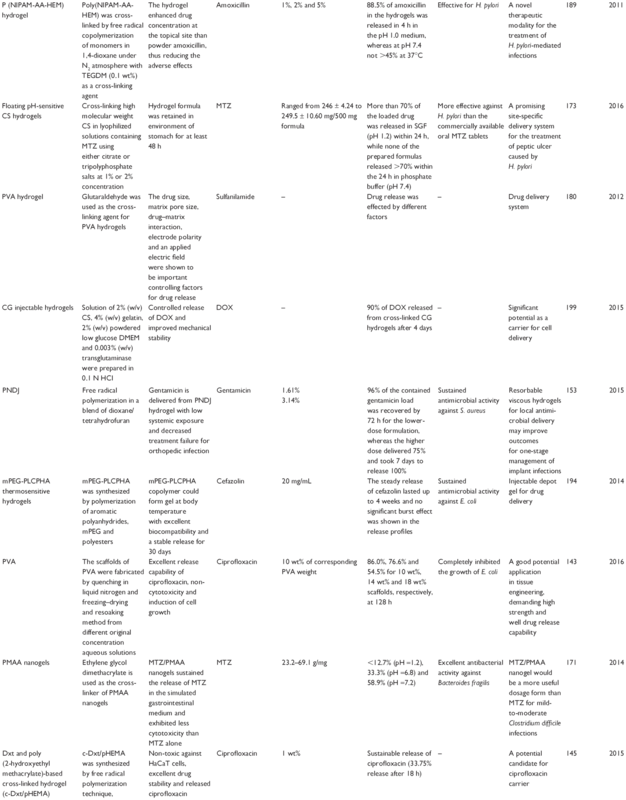 Jakovac S, Bojic EF, Ibrisimovic MA, Tutis B, Ostojic M, Hukic M. Characteristics of vancomycin-resistant enterococcus strains in the west balkans: a first report. Microb Drug Resist. 2017;23(1):122–126. Yang J, Jiang Y, Guo L, Ye L, Ma Y, Luo Y. Prevalence of diverse clones of vancomycin-resistant Enterococcus faecium ST78 in a Chinese hospital. Microb Drug Resist. 2016;22(4):294–300. Simoes SM, Veiga F, Torres-Labandeira JJ, et al. Syringeable pluronic-alpha-cyclodextrin supramolecular gels for sustained delivery of vancomycin. Eur J Pharm Biopharm. 2012;80(1):103–112. Zhao Y, Zhang X, Wang Y, et al. In situ cross-linked polysaccharide hydrogel as extracellular matrix mimics for antibiotics delivery. Carbohydr Polym. 2014;105:63–69. Pakzad Y, Ganji F. Thermosensitive hydrogel for periodontal application: in vitro drug release, antibacterial activity and toxicity evaluation. J Biomater Appl. 2016;30(7):919–929. Gustafson CT, Boakye-Agyeman F, Brinkman CL, et al. Controlled delivery of vancomycin via charged hydrogels. PLoS One. 2016;11(1):e0146401. Lakes AL, Peyyala R, Ebersole JL, Puleo DA, Hilt JZ, Dziubla TD. Synthesis and characterization of an antibacterial hydrogel containing covalently bound vancomycin. Biomacromolecules. 2014;15(8):3009–3018. Zhang J-Z, Xiao C-S, Wang J-C, Zhuang X-L, Chen X-S. Photo cross-linked biodegradable hydrogels for enhanced vancomycin loading and sustained release. Chin J Polym Sci. 2013;31(12):1697–1705. Guzman-Trampe S, Ceapa CD, Manzo-Ruiz M, Sanchez S. Synthetic biology era: improving antibiotic’s world. Biochem Pharmacol. 2017;134:99–113. 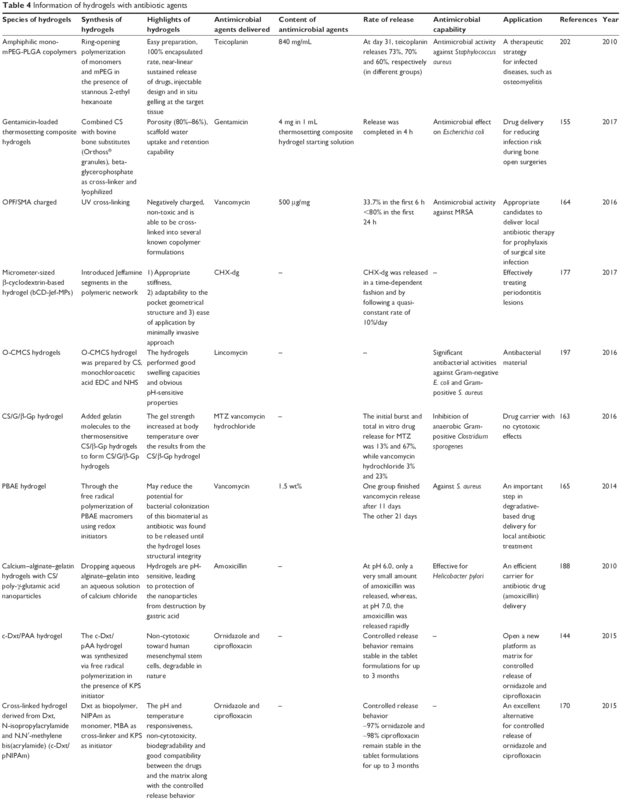 Ford AC, Forman D, Hunt RH, Yuan Y, Moayyedi P. Helicobacter pylori eradication therapy to prevent gastric cancer in healthy asymptomatic infected individuals: systematic review and meta-analysis of randomised controlled trials. BMJ. 2014;348:g3174. Vaghani SS, Patel MM, Satish CS. Synthesis and characterization of pH-sensitive hydrogel composed of carboxymethyl chitosan for colon targeted delivery of ornidazole. Carbohydr Res. 2012;347(1):76–82. Das D, Ghosh P, Ghosh A, et al. Stimulus-responsive, biodegradable, biocompatible, covalently cross-linked hydrogel based on dextrin and Poly(N-isopropylacrylamide) for in vitro/in vivo controlled drug release. ACS Appl Mater Interfaces. 2015;7(26):14338–14351. Chen T, Chen L, Li H, et al. Design and in vitro evaluation of a novel poly(methacrylic acid)/metronidazole antibacterial nanogel as an oral dosage form. Colloids Surf B Biointerfaces. 2014;118C:65–71. Samanta HS, Ray SK. Controlled release of tinidazole and theophylline from chitosan based composite hydrogels. Carbohydr Polym. 2014;106:109–120. El-Mahrouk GM, Aboul-Einien MH, Makhlouf AI. Design, optimization, and evaluation of a novel metronidazole-loaded gastro-retentive pH-sensitive hydrogel. AAPS PharmSciTech. 2016;17(6):1285–1297. Lboutounne H, Chaulet J-F, Ploton C, Falson F, Pirot F. Sustained ex vivo skin antiseptic activity of chlorhexidine in poly (ε-caprolactone) nanocapsule encapsulated form and as a digluconate. J Controll Rel. 2002;82(2):319–334. Ji QX, Zhao QS, Deng J, Lu R. A novel injectable chlorhexidine thermosensitive hydrogel for periodontal application: preparation, antibacterial activity and toxicity evaluation. J Mater Sci Mater Med. 2010;21(8):2435–2442. Jones DS, Lorimer CP, McCoy CP, Gorman SP. Characterization of the physicochemical, antimicrobial, and drug release properties of thermoresponsive hydrogel copolymers designed for medical device applications. J Biomed Mater Res B Appl Biomater. 2008;85(2):417–426. Morelli L, Cappelluti MA, Ricotti L, Lenardi C, Gerges I. An injectable system for local and sustained release of antimicrobial agents in the periodontal pocket. Macromol Biosci. Epub 2017 May 2. Moritz S, Wiegand C, Wesarg F, et al. Active wound dressings based on bacterial nanocellulose as drug delivery system for octenidine. Int J Pharm. 2014;471(1–2):45–55. Glisoni RJ, Garcia-Fernandez MJ, Pino M, et al. Beta-Cyclodextrin hydrogels for the ocular release of antibacterial thiosemicarbazones. Carbohydr Polym. 2013;93(2):449–457. Sittiwong J, Niamlang S, Paradee N, Sirivat A. Electric field-controlled benzoic acid and sulphanilamide delivery from poly(vinyl alcohol) hydrogel. AAPS PharmSciTech. 2012;13(4):1407–1415. Yunoki S, Kohta M, Ohyabu Y, Sekiguchi M, Kubo T, Iwasaki T. Electrostatic immobilization of cetylpyridinium chloride to poly (vinyl alcohol) hydrogels for the simple fabrication of wound dressings with the suppressed release of antibacterial agents. J Appl Polym Sci. 2014;131:40456. Nho Y-C, Lim Y-M, Gwon H-J, Choi E-K. Preparation and characterization of PVA/PVP/glycerin/antibacterial agent hydrogels using γ-irradiation followed by freeze-thawing. Korean J Chem Eng. 2009;26(6):1675–1678. Vogt PM, Reimer K, Hauser J, et al. PVP-iodine in hydrosomes and hydrogel – a novel concept in wound therapy leads to enhanced epithelialization and reduced loss of skin grafts. Burns. 2006;32(6):698–705. Zhao C, Li X, Li L, Cheng G, Gong X, Zheng J. Dual functionality of antimicrobial and antifouling of poly(N-hydroxyethylacrylamide)/salicylate hydrogels. Langmuir. 2013;29(5):1517–1524. Ma D, Cai X, Lin Q, et al. Alginate hydrogel sphere improves the alkali and heat resistances of isothiazolinones with long – term antibacterial activity. J Appl Polym Sci. 2013;130(3):1554–1561. Lv ZF, Wang FC, Zheng HL, et al. 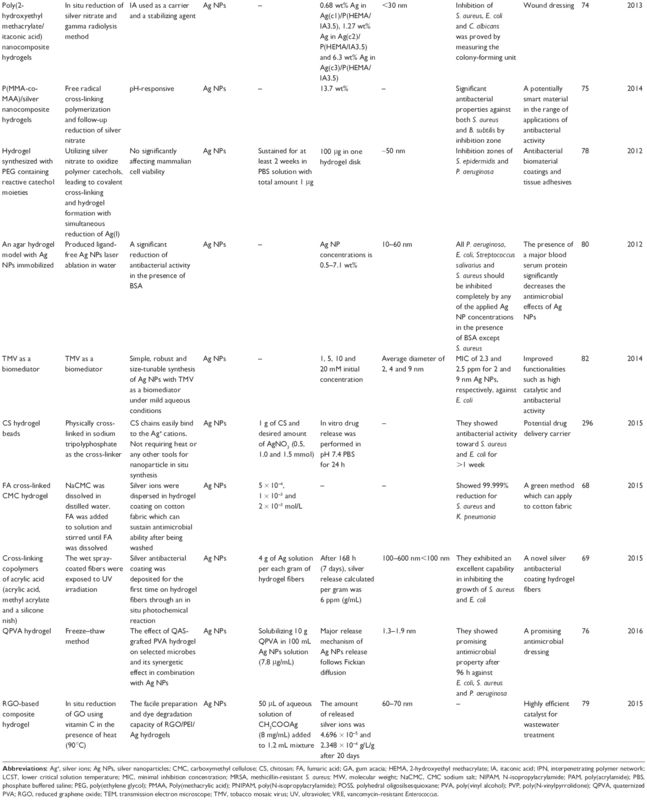 Meta-analysis: is combination of tetracycline and amoxicillin suitable for Helicobacter pylori infection? World J Gastroenterol. 2015;21(8):2522–2533. Selvakumaran S, Muhamad II, Abd Razak SI. Evaluation of kappa carrageenan as potential carrier for floating drug delivery system: effect of pore forming agents. Carbohydr Polym. 2016;135:207–214. Chang CH, Lin YH, Yeh CL, et al. Nanoparticles incorporated in pH-sensitive hydrogels as amoxicillin delivery for eradication of Helicobacter pylori. Biomacromolecules. 2010;11(1):133–142. Moogooee M, Ramezanzadeh H, Jasoori S, Omidi Y, Davaran S. Synthesis and in vitro studies of cross-linked hydrogel nanoparticles containing amoxicillin. J Pharm Sci. 2011;100(3):1057–1066. Kamoun EA, Kenawy E-RS, Tamer TM, El-Meligy MA, Mohy Eldin MS. Poly (vinyl alcohol)-alginate physically crosslinked hydrogel membranes for wound dressing applications: characterization and bio-evaluation. Arab J Chem. 2013;8(1):38–47. Grohs P, Podglajen I, Guerot E, et al. Assessment of five screening strategies for optimal detection of carriers of third-generation cephalosporin-resistant Enterobacteriaceae in intensive care units using daily sampling. Clin Microbiol Infect. 2014;20(11):O879–O886. Atta S, Khaliq S, Islam A, et al. Injectable biopolymer based hydrogels for drug delivery applications. Int J Biol Macromol. 2015;80:240–245. Venugopalarao G, Sreenivas Gowtham M, Sarada NC. Formulation evaluation and stability studies of hydrogel tablets containing Cefditoren Pivoxil. J Pharm Res. 2013;7(3):230–234. Lai PL, Hong DW, Ku KL, Lai ZT, Chu IM. Novel thermosensitive hydrogels based on methoxy polyethylene glycol-co-poly(lactic acid-co-aromatic anhydride) for cefazolin delivery. Nanomedicine. 2014;10(3):553–560. Islan GA, Dini C, Bartel LC, Bolzan AD, Castro GR. Characterization of smart auto-degradative hydrogel matrix containing alginate lyase to enhance levofloxacin delivery against bacterial biofilms. Int J Pharm. 2015;496(2):953–964. Li Y, Zhou F, Wen Y, et al. (-)-Menthol based thixotropic hydrogel and its application as a universal antibacterial carrier. Soft Matter. 2014;10(17):3077. He G, Chen X, Yin Y, et al. Preparation and antibacterial properties of O-carboxymethyl chitosan/lincomycin hydrogels. J Biomater Sci Polym Ed. 2016;27(4):370–384. He Z-X, Wang Z-H, Zhang H-H, et al. Doxycycline and hydroxypropyl-β-cyclodextrin complex in poloxamer thermal sensitive hydrogel for ophthalmic delivery. Acta Pharmaceutica Sinica B. 2011;1(4):254–260. Tormos CJ, Abraham C, Madihally SV. Improving the stability of chitosan-gelatin-based hydrogels for cell delivery using transglutaminase and controlled release of doxycycline. Drug Deliv Transl Res. 2015;5(6):575–584. Hurler J, Berg OA, Skar M, Conradi AH, Johnsen PJ, Skalko-Basnet N. Improved burns therapy: liposomes-in-hydrogel delivery system for mupirocin. J Pharm Sci. 2012;101(10):3906–3915. Hurler J, Sorensen KK, Fallarero A, Vuorela P, Skalko-Basnet N. Liposomes-in-hydrogel delivery system with mupirocin: in vitro antibiofilm studies and in vivo evaluation in mice burn model. Biomed Res Int. 2013;2013:498485. Peng KT, Chen CF, Chu IM, et al. Treatment of osteomyelitis with teicoplanin-encapsulated biodegradable thermosensitive hydrogel nanoparticles. Biomaterials. 2010;31(19):5227–5236. Nafee N, Youssef A, El-Gowelli H, Asem H, Kandil S. Antibiotic-free nanotherapeutics: hypericin nanoparticles thereof for improved in vitro and in vivo antimicrobial photodynamic therapy and wound healing. Int J Pharm. 2013;454(1):249–258. Lai WF, Rogach AL. Hydrogel-based materials for delivery of herbal medicines. ACS Appl Mater Interfaces. 2017;9(13):11309–11320. Tan SP, McLoughlin P, O’Sullivan L, et al. Development of a novel antimicrobial seaweed extract-based hydrogel wound dressing. Int J Pharm. 2013;456(1):10–20. Varshney L. Role of natural polysaccharides in radiation formation of PVA–hydrogel wound dressing. Nucl Instrum Methods Phys Res B. 2007;255(2):343–349. Engel H, Kao SW, Larson J, et al. Investigation of Dermis-derived hydrogels for wound healing applications. Biomed J. 2015;38(1):58–64. Peng C-W, Lin H-Y, Wang H-W, Wu W-W. The influence of operating parameters on the drug release and anti-bacterial performances of alginate wound dressings prepared by three-dimensional plotting. Mater Sci Eng C. 2012;32(8):2491–2500. Pirak T, Jangchud A, Jantawat P. Characterisation of physical, chemical and antimicrobial properties of allicin-chitosan complexes. Int J Food Sci Technol. 2012;47(7):1339–1347. Qureshi MA, Khatoon F, Rizvi MA, Zafaryab M. Ethyl acetate Salix alba leaves extract-loaded chitosan-based hydrogel film for wound dressing applications. J Biomater Sci Polym Ed. 2015;26(18):1452–1464. Casero C, Machin F, Mendez-Alvarez S, et al. Structure and antimicrobial activity of phloroglucinol derivatives from Achyrocline satureioides. J Nat Prod. 2015;78(1):93–102. Basniwal RK, Buttar HS, Jain VK, Jain N. Curcumin nanoparticles: preparation, characterization, and antimicrobial study. J Agric Food Chem. 2011;59(5):2056–2061. Varaprasad K, Mohan YM, Vimala K, Mohana Raju K. Synthesis and characterization of hydrogel-silver nanoparticle-curcumin composites for wound dressing and antibacterial application. J Appl Polym Sci. 2011;121(2):784–796. Ravindra S, Mulaba-Bafubiandi AF, Rajinikanth V, Varaprasad K, Narayana Reddy N, Mohana Raju K. Development and characterization of curcumin loaded silver nanoparticle hydrogels for antibacterial and drug delivery applications. J Inorg Organometal Polym Mater. 2012;22(6):1254–1262. Sierra-Garcia GD, Castro-Rios R, Gonzalez-Horta A, Lara-Arias J, Chavez-Montes A. Acemannan, an extracted polysaccharide from Aloe vera: a literature review. Nat Prod Commun. 2014;9(8):1217–1221. Cellini L, Di Bartolomeo S, Di Campli E, Genovese S, Locatelli M, Di Giulio M. In vitro activity of Aloe vera inner gel against Helicobacter pylori strains. Lett Appl Microbiol. 2014;59(1):43–48. Pereira RF, Bartolo PJ. Traditional therapies for skin wound healing. Adv Wound Care (New Rochelle). 2016;5(5):208–229. Seow YX, Yeo CR, Chung HL, Yuk HG. Plant essential oils as active antimicrobial agents. Crit Rev Food Sci Nutr. 2014;54(5):625–644. Vergis J, Gokulakrishnan P, Agarwal RK, Kumar A. 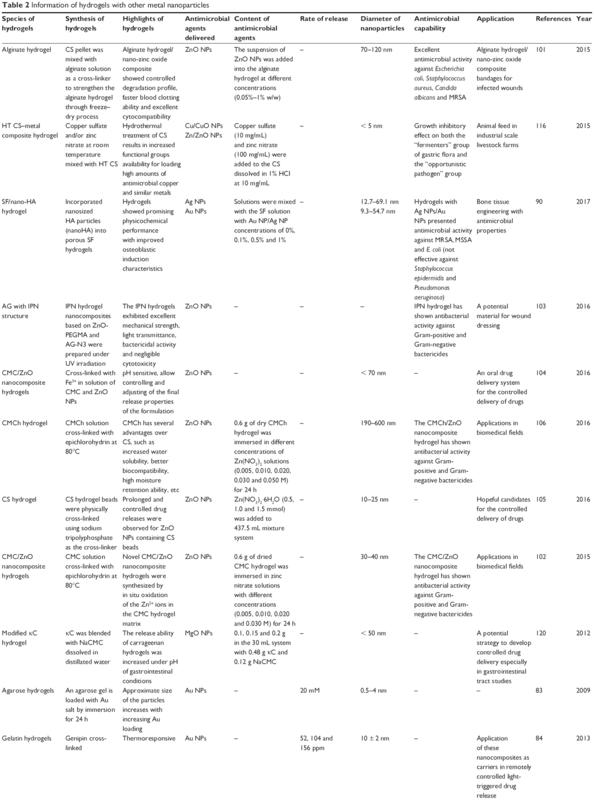 Essential oils as natural food antimicrobial agents: a review. Crit Rev Food Sci Nutr. 2015;55(10):1320–1323. Liakos I, Rizzello L, Scurr DJ, Pompa PP, Bayer IS, Athanassiou A. All-natural composite wound dressing films of essential oils encapsulated in sodium alginate with antimicrobial properties. Int J Pharm. 2014;463(2):137–145. Yusof N, Ainul Hafiza AH, Zohdi RM, Bakar MZA. Development of honey hydrogel dressing for enhanced wound healing. Radiat Phys Chem. 2007;76(11–12):1767–1770. Qiao M, Chen D, Hao T, Zhao X, Hu H, Ma X. Effect of bee venom peptide-copolymer interactions on thermosensitive hydrogel delivery systems. Int J Pharm. 2007;345(1–2):116–124. Zhang S, Borazjani RN, Salamone JC, Ahearn DG, Crow SA Jr, Pierce GE. In vitro deposition of lysozyme on etafilcon A and balafilcon A hydrogel contact lenses: effects on adhesion and survival of Pseudomonas aeruginosa and Staphylococcus aureus. Cont Lens Anterior Eye. 2005;28(3):113–119. Lee ALZ, Ng VWL, Wang WX, Hedrick JL, Yang YY. Block copolymer mixtures as antimicrobial hydrogels for biofilm eradication. Biomaterials. 2013;34(38):10278–10286. Spasojevic D, Zmejkoski D, Glamoclija J, et al. Lignin model compound in alginate hydrogel: a strong antimicrobial agent with high potential in wound treatment. Int J Antimicrob Agents. 2016;48(6):732–735. Gao P, Nie X, Zou M, Shi Y, Cheng G. Recent advances in materials for extended-release antibiotic delivery system. J Antibiot. 2011;64(9):625–634. Palza H. Antimicrobial polymers with metal nanoparticles. Int J Mol Sci. 2015;16(1):2099–2116. Sui X, Feng X, Di Luca A, et al. Poly (N-isopropylacrylamide)–poly (ferrocenylsilane) dual-responsive hydrogels: synthesis, characterization and antimicrobial applications. Polym Chem. 2013;4(2):337–342. Jiang Q, Xu J, Li T, Qiao C, Li Y. Synthesis and antibacterial activities of quaternary ammonium salt of gelatin. J Macromol Sci B. 2014;53(1):133–141. Tomić SL, Mićić MM, Dobić SN, Filipović JM, Suljovrujić EH. Smart poly(2-hydroxyethyl methacrylate/itaconic acid) hydrogels for biomedical application. Radiat Phys Chem. 2010;79(5):643–649. La Y-H, McCloskey BD, Sooriyakumaran R, et al. Bifunctional hydrogel coatings for water purification membranes: improved fouling resistance and antimicrobial activity. J Memb Sci. 2011;372(1–2):285–291. Parsons C, McCoy CP, Gorman SP, et al. Anti-infective photodynamic biomaterials for the prevention of intraocular lens-associated infectious endophthalmitis. Biomaterials. 2009;30(4):597–602. Halpenny GM, Steinhardt RC, Okialda KA, Mascharak PK. Characterization of pHEMA-based hydrogels that exhibit light-induced bactericidal effect via release of NO. J Mater Sci Mater Med. 2009;20(11):2353–2360. Fjell CD, Hiss JA, Hancock RE, Schneider G. Designing antimicrobial peptides: form follows function. Nat Rev Drug Discov. 2011;11(1):37–51. Brogden KA. Antimicrobial peptides: pore formers or metabolic inhibitors in bacteria? Nat Rev Microbiol. 2005;3(3):238–250. Lakshmaiah Narayana J, Chen JY. 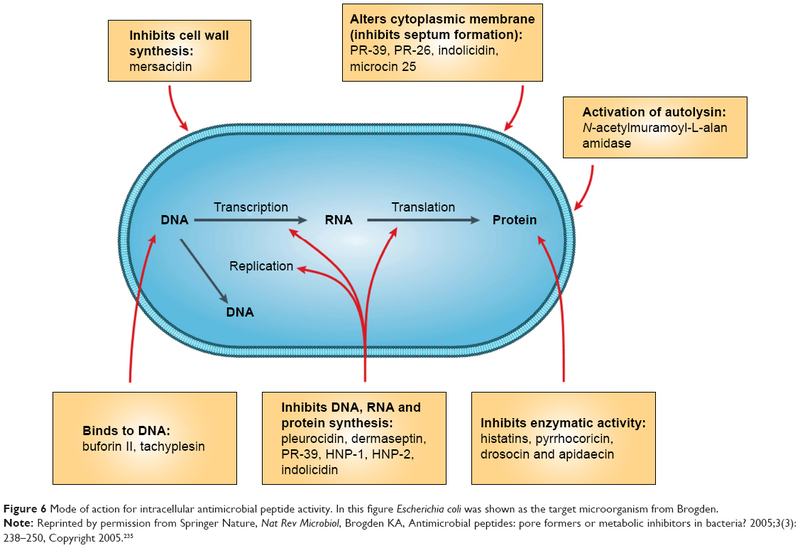 Antimicrobial peptides: possible anti-infective agents. Peptides. 2015;72:88–94. Salick DA, Kretsinger JK, Pochan DJ, Schneider JP. Inherent antibacterial activity of a peptide-based β-hairpin hydrogel. J Am Chem Soc. 2007;129(47):14793–14799. Veiga AS, Sinthuvanich C, Gaspar D, Franquelim HG, Castanho MARB, Schneider JP. Arginine-rich self-assembling peptides as potent antibacterial gels. Biomaterials. 2012;33(35):8907–8916. Liu Y, Yang Y, Wang C, Zhao X. Stimuli-responsive self-assembling peptides made from antibacterial peptides. Nanoscale. 2013;5(14):6413–6421. Cleophas RT, Sjollema J, Busscher HJ, Kruijtzer JA, Liskamp RM. Characterization and activity of an immobilized antimicrobial peptide containing bactericidal PEG-hydrogel. Biomacromolecules. 2014;15(9):3390–3395. Li Y-Q, Han Q, Feng J-L, Tian W-L, Mo H-Z. Antibacterial characteristics and mechanisms of ε-poly-lysine against Escherichia coli and Staphylococcus aureus. Food Control. 2014;43:22–27. Zhou C, Li P, Qi X, et al. A photopolymerized antimicrobial hydrogel coating derived from epsilon-poly-l-lysine. Biomaterials. 2011;32(11):2704–2712. Jiang L, Xu D, Sellati TJ, Dong H. Self-assembly of cationic multidomain peptide hydrogels: supramolecular nanostructure and rheological properties dictate antimicrobial activity. Nanoscale. 2015;7(45):19160–19169. Laverty G, Gorman SP, Gilmore BF. Antimicrobial peptide incorporated poly(2-hydroxyethyl methacrylate) hydrogels for the prevention of Staphylococcus epidermidis-associated biomaterial infections. J Biomed Mater Res A. 2012;100(7):1803–1814. Baranova O, Kuz’min N, Samsonova T, et al. Medical hydrogels based on bioactive compounds. Synthesis, properties, and possible application for preparing bactericidal materials. Fibre Chem. 2011;43(1):90–103. Steckbeck JD, Deslouches B, Montelaro RC. Antimicrobial peptides: new drugs for bad bugs? Expert Opin Biol Ther. 2014;14(1):11–14. Ashby M, Petkova A, Hilpert K. Cationic antimicrobial peptides as potential new therapeutic agents in neonates and children: a review. Curr Opin Infect Dis. 2014;27(3):258–267. Forbes S, McBain AJ, Felton-Smith S, Jowitt TA, Birchenough HL, Dobson CB. Comparative surface antimicrobial properties of synthetic biocides and novel human apolipoprotein E derived antimicrobial peptides. Biomaterials. 2013;34(22):5453–5464. Pletzer D, Hancock RE. Antibiofilm peptides: potential as broad-spectrum agents. J Bacteriol. 2016;198(19):2572–2578. Song A, Rane AA, Christman KL. Antibacterial and cell-adhesive polypeptide and poly(ethylene glycol) hydrogel as a potential scaffold for wound healing. Acta Biomater. 2012;8(1):41–50. Buhrman JS, Cook LC, Rayahin JE, Federle MJ, Gemeinhart RA. Proteolytically activated anti-bacterial hydrogel microspheres. J Control Rel. 2013;171(3):288–295. Xie Z, Aphale NV, Kadapure TD, et al. Design of antimicrobial peptides conjugated biodegradable citric acid derived hydrogels for wound healing. J Biomed Mater Res A. 2015;103(12):3907–3918. Melchionna M, Styan KE, Marchesan S. The unexpected advantages of using D-amino acids for peptide self-assembly into nanostructured hydrogels for medicine. Curr Top Med Chem. 2016;16(18):2009–2018. Liu L, Huang Y, Riduan SN, et al. Main-chain imidazolium oligomer material as a selective biomimetic antimicrobial agent. Biomaterials. 2012;33(33):8625–8631. Locock KE, Michl TD, Valentin JD, et al. Guanylated polymethacrylates: a class of potent antimicrobial polymers with low hemolytic activity. Biomacromolecules. 2013;14(11):4021. Lienkamp K, Kumar KN, Som A, Nüsslein K, Tew GN. “Doubly selective” antimicrobial polymers: how do they differentiate between bacteria? Chemistry. 2009;15(43):11710–11714. Thaker HD, Cankaya A, Scott RW, Tew GN. Role of amphiphilicity in the design of synthetic mimics of antimicrobial peptides with Gram-negative activity. Acs Med Chem Lett. 2013;4(5):481. Liu R, Chen X, Hayouka Z, et al. Nylon-3 polymers with selective antifungal activity. J Am Chem Soc. 2013;135(14):5270–5273. Chakraborty S, Liu R, Lemke JJ, et al. Effects of cyclic vs. acyclic hydrophobic subunits on the chemical structure and biological properties of nylon-3 co-polymers. Acs Macro Lett. 2011;2(8):753–756. Ng VW, Ke X, Lee AL, Hedrick JL, Yang YY. Synergistic co-delivery of membrane-disrupting polymers with commercial antibiotics against highly opportunistic bacteria. Adv Mater Deerfield. 2013;25(46):6730–6736. Engler AC, Tan JP, Ong ZY, et al. Antimicrobial polycarbonates: investigating the impact of balancing charge and hydrophobicity using a same-centered polymer approach. Biomacromolecules. 2013;14(12):4331. Chin W, Yang C, Ng VWL, et al. Biodegradable broad-spectrum antimicrobial polycarbonates: investigating the role of chemical structure on activity and selectivity. Macromolecules. 2014;46(22):8797–8807. Jiang S, Cao Z. Ultralow-fouling, functionalizable, and hydrolyzable zwitterionic materials and their derivatives for biological applications. Adv Mater Deerfield. 2010;22(9):920. Cao Z, Jiang S. Super-hydrophilic zwitterionic poly(carboxybetaine) and amphiphilic non-ionic poly(ethylene glycol) for stealth nanoparticles. Nano Today. 2012;7(5):404–413. Mi L, Jiang S. Synchronizing nonfouling and antimicrobial properties in a zwitterionic hydrogel. Biomaterials. 2012;33(35):8928–8933. Liu SQ, Yang C, Huang Y, et al. Antimicrobial and antifouling hydrogels formed in situ from polycarbonate and poly(ethylene glycol) via Michael addition. Adv Mater Deerfield. 2012;24(48):6484–6489. Li X, Dong Q, He P. Synthesis and water absorbency of polyampholytic hydrogels with antibacterial activity. J Appl Polym Sci. 2009;112(1):439–446. Debnath S, Shome A, Das D, Das PK. Hydrogelation through self-assembly of Fmoc-peptide functionalized cationic amphiphiles: potent antibacterial agent. J Phys Chem B. 2010;114(13):4407–4415. Dutta S, Kar T, Mandal D, Das PK. Structure and properties of cholesterol-based hydrogelators with varying hydrophilic terminals: biocompatibility and development of antibacterial soft nanocomposites. Langmuir. 2013;29(1):316–327. Bernet A, Behr M, Schmidt H-W. Supramolecular hydrogels based on antimycobacterial amphiphiles. Soft Matter. 2012;8(18):4873. Bursali EA, Coskun S, Kizil M, Yurdakoc M. Synthesis, characterization and in vitro antimicrobial activities of boron/starch/polyvinyl alcohol hydrogels. Carbohydr Polym. 2011;83(3):1377–1383. Nazarzadeh Zare E, Mansour Lakouraj M, Mohseni M. Biodegradable polypyrrole/dextrin conductive nanocomposite: synthesis, characterization, antioxidant and antibacterial activity. Synth Met. 2014;187:9–16. Wang H, Wilksch JJ, Lithgow T, Strugnell RA, Gee ML. Nanomechanics measurements of live bacteria reveal a mechanism for bacterial cell protection: the polysaccharide capsule in Klebsiella is a responsive polymer hydrogel that adapts to osmotic stress. Soft Matter. 2013;9(31):7560. Sang LY, Zhou XH, Yun F, Zhang GL. Enzymatic synthesis of chitosan-gelatin antimicrobial copolymer and its characterisation. J Sci Food Agric. 2010;90(1):58–64. Ding F, Nie Z, Deng H, Xiao L, Du Y, Shi X. Antibacterial hydrogel coating by electrophoretic co-deposition of chitosan/alkynyl chitosan. Carbohydr Polym. 2013;98(2):1547–1552. Straccia MC, d’Ayala GG, Romano I, Oliva A, Laurienzo P. Alginate hydrogels coated with chitosan for wound dressing. Mar Drugs. 2015;13(5):2890–2908. Fan L, Yang J, Wu H, et al. Preparation and characterization of quaternary ammonium chitosan hydrogel with significant antibacterial activity. Int J Biol Macromol. 2015;79:830–836. Liu B, Hu J, Meng Q. Nonwoven supported temperature-sensitive poly(N-isopropylacrylamide)/polyurethane copolymer hydrogel with antibacterial activity. J Biomed Mater Res B Appl Biomater. 2009;89(1):1–8. Noppakundilograt S, Sonjaipanich K, Thongchul N, Kiatkamjornwong S. Syntheses, characterization, and antibacterial activity of chitosan grafted hydrogels and associated mica-containing nanocomposite hydrogels. J Appl Polym Sci. 2013;127(6):4927–4938. Salick DA, Pochan DJ, Schneider JP. Design of an injectable β-hairpin peptide hydrogel that kills Methicillin-resistant Staphylococcus aureus. Adv Mater Deerfield. 2010;21(41):4120–4123. Hughes M, Debnath S, Knapp CW, Ulijn RV. Antimicrobial properties of enzymatically triggered self-assembling aromatic peptide amphiphiles. Biomaterialsence. 2013;1(11):1138–1142. Satarkar NS, Hawkins AM, Hilt JZ. Hydrogel nanocomposites in biology and medicine: applications and interactions. In: Puleo D, Bizios R, editors. Biological Interactions on Materials Surfaces. New York: Springer; 2009:319–342. Reithofer MR, Lakshmanan A, Ping AT, Chin JM, Hauser CA. In situ synthesis of size-controlled, stable silver nanoparticles within ultrashort peptide hydrogels and their anti-bacterial properties. Biomaterials. 2014;35(26):7535–7542. Eid M. Gamma radiation synthesis and characterization of starch based polyelectrolyte hydrogels loaded silver nanoparticles. J Inorg Organometal Polym Mater. 2011;21(2):297–305. Dutta S, Shome A, Kar T, Das PK. Counterion-induced modulation in the antimicrobial activity and biocompatibility of amphiphilic hydrogelators: influence of in-situ-synthesized Ag-nanoparticle on the bactericidal property. Langmuir. 2011;27(8):5000–5008. Shome A, Dutta S, Maiti S, Das PK. In situ synthesized Ag nanoparticle in self-assemblies of amino acid based amphiphilic hydrogelators: development of antibacterial soft nanocomposites. Soft Matter. 2011;7(6):3011. GhavamiNejad A, Park CH, Kim CS. In situ synthesis of antimicrobial silver nanoparticles within antifouling zwitterionic hydrogels by catecholic redox chemistry for wound healing application. Biomacromolecules. 2016;17(3):1213–1223. Liu Y, Ma W, Liu W, et al. Silver(i)–glutathione biocoordination polymer hydrogel: effective antibacterial activity and improved cytocompatibility. J Mater Chem. 2011;21(48):19214. Anjum S, Gupta A, Sharma D, et al. Development of novel wound care systems based on nanosilver nanohydrogels of polymethacrylic acid with Aloe vera and curcumin. Mater Sci Eng C Mater Biol Appl. 2016;64:157–166. Vasile BS, Oprea O, Voicu G, et al. Synthesis and characterization of a novel controlled release zinc oxide/gentamicin-chitosan composite with potential applications in wounds care. Int J Pharm. 2014;463(2):161–169. Rouabhia M, Asselin J, Tazi N, Messaddeq Y, Levinson D, Zhang Z. Production of biocompatible and antimicrobial bacterial cellulose polymers functionalized by RGDC grafting groups and gentamicin. ACS Appl Mater Interfaces. 2014;6(3):1439–1446. Paradiso P, Serro AP, Saramago B, Colaco R, Chauhan A. Controlled release of antibiotics from vitamin E-loaded silicone-hydrogel contact lenses. J Pharm Sci. 2016;105(3):1164–1172. Reed TP, Thomas LA, Weeren FR, Ruth JD, Anders BB. A novel dextran polymer hydrogel local antimicrobial therapy in dogs: a pilot study. Can Vet J. 2016;57(2):189–195. Novac O, Lisa G, Profire L, Tuchilus C, Popa MI. Antibacterial quaternized gellan gum based particles for controlled release of ciprofloxacin with potential dermal applications. Mater Sci Eng C. 2014;35:291–299. Bardajee GR, Hooshyar Z, Rezanezhad H. A novel and green biomaterial based silver nanocomposite hydrogel: synthesis, characterization and antibacterial effect. J Inorg Biochem. 2012;117:367–373. Yadollahi M, Farhoudian S, Namazi H. One-pot synthesis of antibacterial chitosan/silver bio-nanocomposite hydrogel beads as drug delivery systems. Int J Biol Macromol. 2015;79:37–43.